as defined by the type of service they are designed to provide. Long Distance InterCity Trains looks at trains which are designed for InterCity express journeys with journey times usually in excess of 45 minutes and possibly lasting for many hours. Also covered are some European super-fast very high speed trains and tilting trains. Medium Distance Trains looks at different types of trains that provide medium distance services, typically with journey times of between 30 and 90 minutes in duration, but sometimes longer too. Short Distance Trains looks at trains designed for journeys of anything from less than a minute up to about 45 minutes within urban areas and their close hinterland. These trains could be operated by either a mainline railway company or a city-specific regional transport authority. Included within this remit are Automated 'Driverless' Metro Systems and Trams, Streetcars and Light Rail Vehicles; however to avoid making a very large page the latter two topics have their own dedicated pages. "Walk-through" Trains looks at the need to be able to walk from carriage to carriage along an entire train's length, this being an aspect of train design where practical day-to-day passenger requirements are often compromised. On-train Refreshment Facilities, Double-Deck Trains, & Taking Bicycles On Trains looks at three specific aspects of railway operation which transcends all the other categories as described above. Some images are "clickable" - run the mouse over them and if a "hand" appears then click & a larger version will open in a new window! 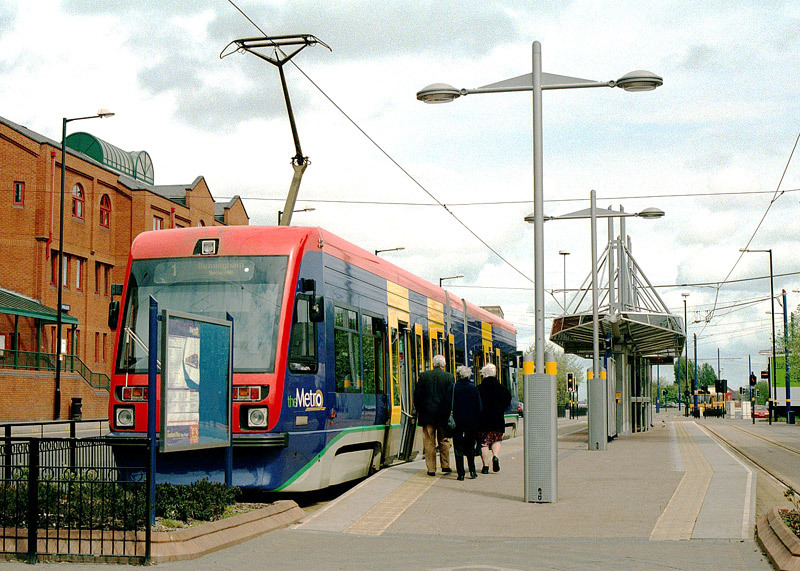 As with other types of railway vehicles light rail vehicles are as variable in design as the services they provide. Almost always electrically powered they are the product of over 100 years of constantly evolving technology, sourced from many highly competitive companies. The difference between a Tram, Streetcar and Light Rail Vehicle is mostly semantic as all refer to basically the same thing, but perhaps of a different era and / or geographical location. 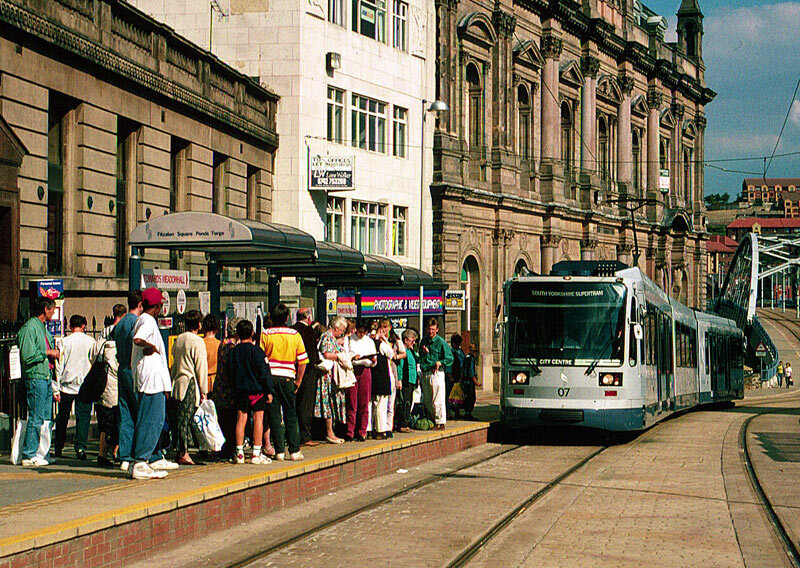 The use of the terms Tram or Streetcar tends to vary according to whether someone speaks the British or American versions of English. (Streetcar comes from German emigrants into America, who translated the German term straßenbahn [street railway] into streetcar). Whatever the name used the reference is to what are frequently rail vehicles of a smaller mass (than mainline railway trains) operating on older or 'historic' (also sometimes called 'legacy') tram systems which have been open since before the 1970's. Many will feature much street trackage which often requires sharing road space shared with other highway users too (cars, buses, etc). Passenger stops are often close together and sometimes require passengers to walk out into the street so that all other road traffic must stop, although where space permits protected loading islands are often provided. Light Rail is used in both versions of English and generally refers to more modern (post 1970), rapid transit-type systems which use slightly larger profile articulated rail vehicles and feature stops (stations) which are slightly further apart. Even where the tracks are within the street domain they will usually feature significant (or even total) separation from street traffic, so that the LRV's are able to pass traffic congestion without being delayed themselves. 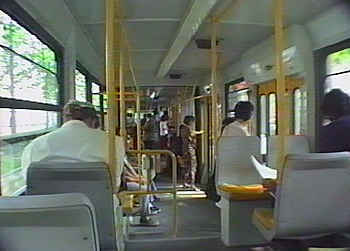 Some light rail systems will be upgraded versions of older tramways which have been rebuilt to 'rapid transit' standards while others could be downgraded mainline railway lines that for various reasons (usually demographic changes) no longer carry as many passengers as they once did, with their conversion to light rail representing a cost efficient alternative to complete closure. 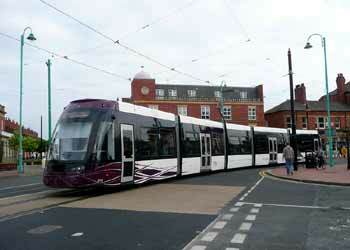 A modern British tram on street tramway trackage in Fleetwood, Lancs. 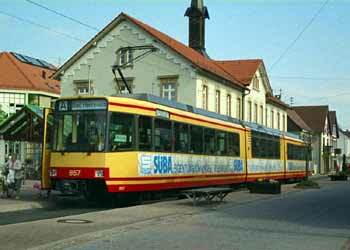 Stuttgart Germany - a modern light rail vehicle which runs on standard gauge track (left) and an older tram (straßenbahn) which runs on metre gauge track (right). 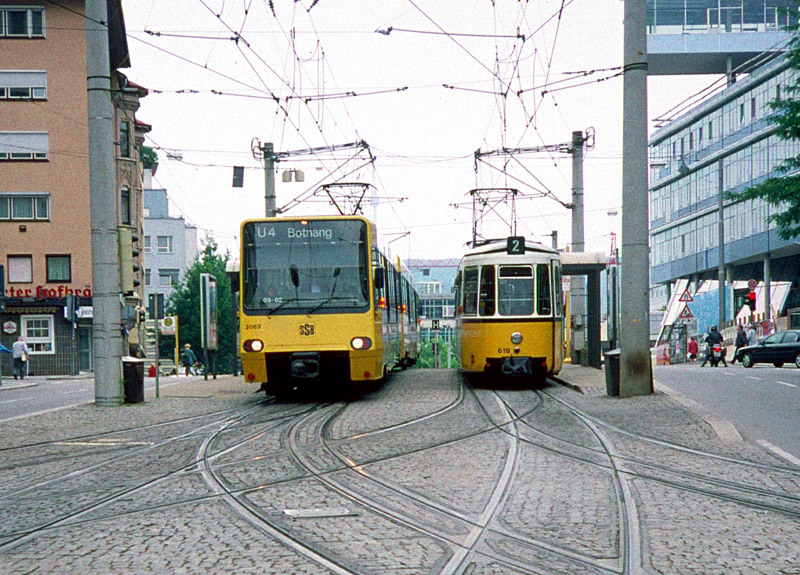 The Stuttgart view (above - right) dates from when the city was partway through a 27 year project of converting / upgrading its largely street-based tram system to a mostly segregated light rail system. The project was completed in December 2007. As the image suggests, as a general theme modern light rail vehicles do tend to be larger / of a heavier mass than older style trams / streetcars. 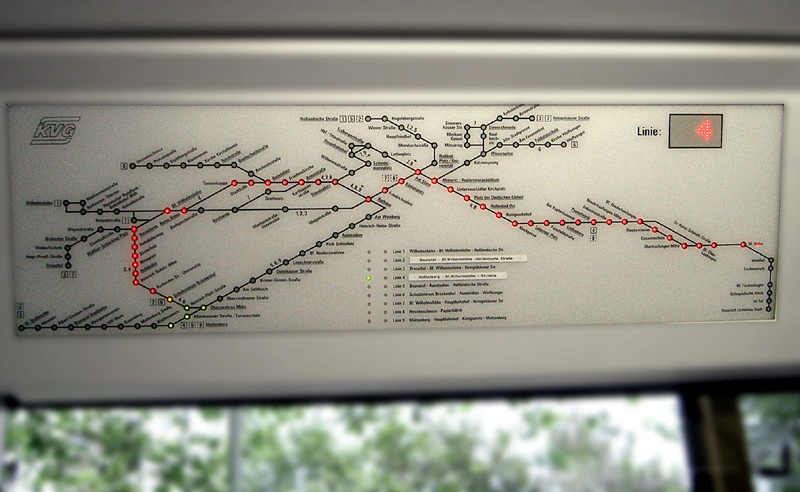 In Germany many light rail lines operate under the U-Bahn (underground railway) banner. This stems from the notion that the importance of the former Federal Capital (Bonn) meant it should have an underground rail system, but being a smaller city light rail was the appropriate mode to suit the traffic flows. 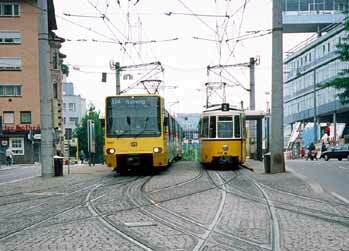 A light rail vehicle (left) and a 'Vintage Trolley' (right). 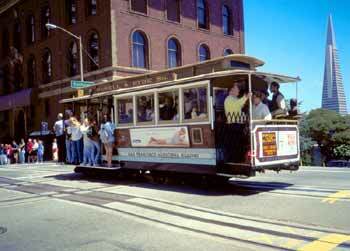 Sometimes Americans will also use the term Trolley. Usually they will be referring to streetcars that are either original or replicas of the type of vehicle that was common in the 1920's. 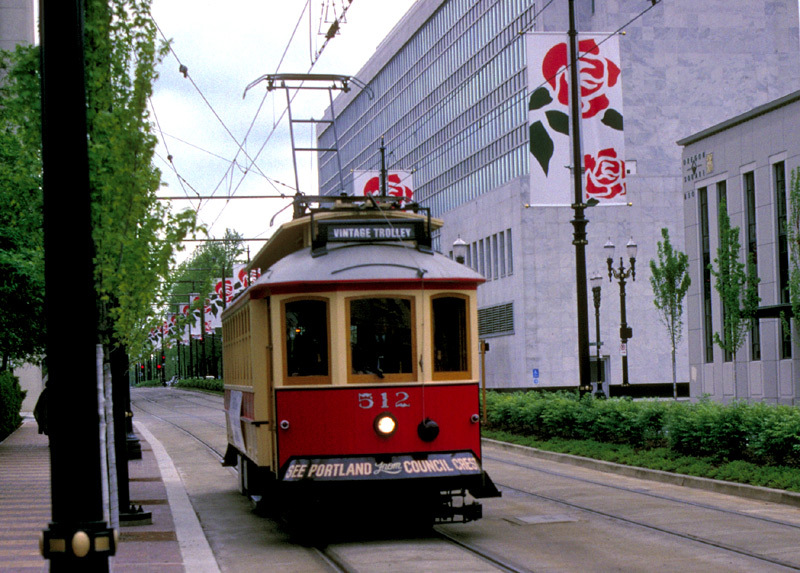 Some modern American light rail systems also use these Vintage Trolleys to provide tourist-orientated services over part of their system. 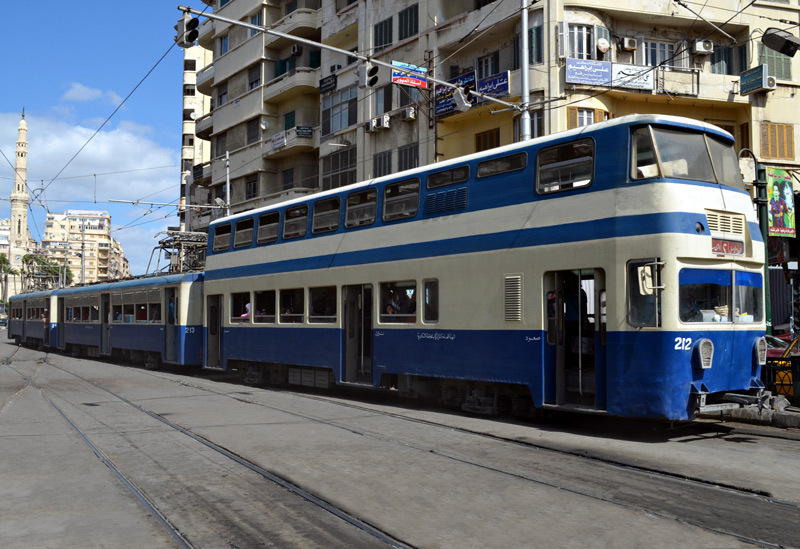 Hong Kong left and Alexandria, Egypt right are the only two places planetwide where double-deck trams are regularly used for high-capacity public transport. Blackpool also retains some older double deck trams which can be used when required, however they are more part of a reserve fleet than regular frontline transports. Nowadays double-decker trams are very rare - apart from museum lines they only exist in Blackpool, Hong Kong, Alexandria and as specialities on a few city centre / downtown distributor services in various parts of America. For mainstream high-capacity services the fashion nowadays is for articulated single-deckers with several sets of doors located along the vehicle's length, the idea being that all these doorways will reduce stop dwell times - so speeding the service. Critics often question the wisdom of long vehicles because of their increased land-take on crowded city streets but their advocates claim that even if the articulated tram is half empty it will still be taking far less roadspace than the cars that would be using the road had the tram not been there! Some transport planners also point to evidence (obtained from double deck buses) which suggests that especially for shorter journeys passengers will shun the upper deck and this leads to overcrowding downstairs and under-utilisation of available space upstairs. To a certain extent there is no clear demarcation between the terms tram, streetcar & light rail vehicle and frequently even transport professionals will mix terminologies in the same sentence. 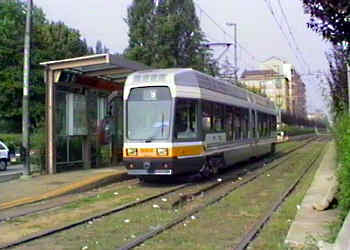 Turin, Italy, a modern tram designed for short distance urban journeys. As with many European designs plenty of space around the doorways is allocated to standing passengers. 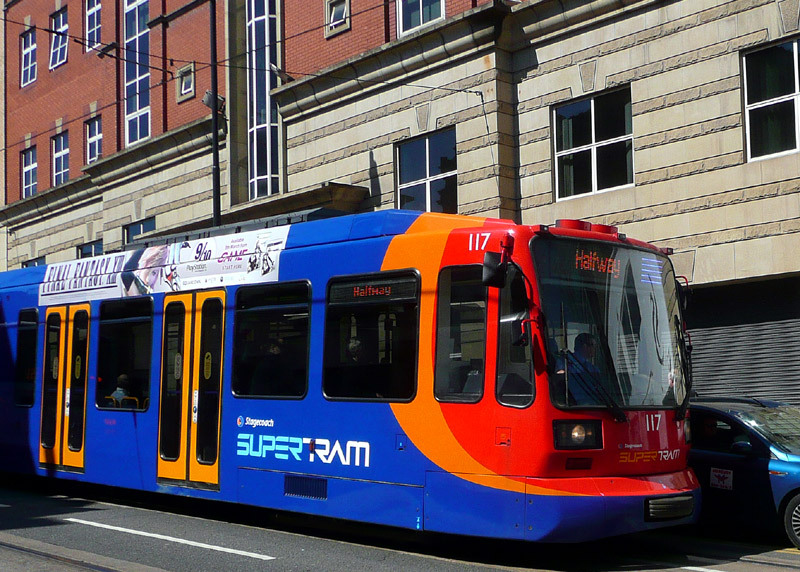 Sheffield, England, a 'supertram' with a higher density of seating - in the English speaking nations passengers expect a seat. 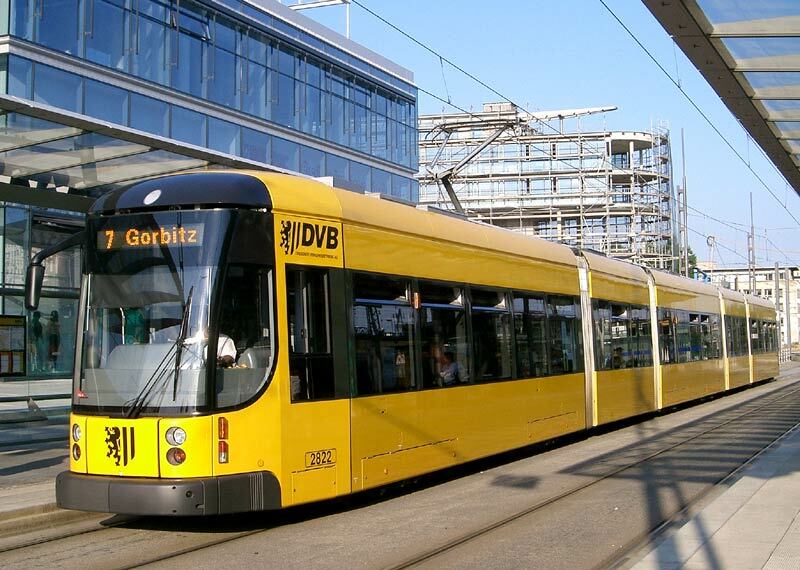 Karlsruhe, Germany, an inter-urban LRV with very comfortable seats and panoramic windows (in the centre section) which let passengers enjoy the view as they travel through pleasant countryside. 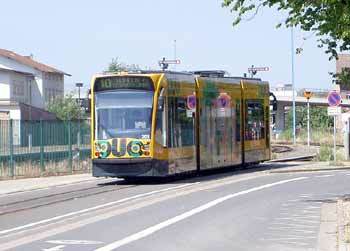 Amongst the longest "single-vehicle" trams are these examples in Dresden, Germany. Featuring five segments they are 45 metres in length. The red lights above the doors are door closing warnings which illuminate before the doors close - this (together with audible warnings) became a standard feature on trains and trams in the former East Germany. At the other end of the scale the ultra light rail British built Parry People Mover which is intended for routes that need high frequency but lower overall passenger flows. The PPM50 in low floor format, which is designed for use within the street environment and calling at tramstops with low level kerb platforms. http://www.parrypeoplemovers.com The first Parry People Mover railcars to enter public service are of a variant designed for calling at mainline railway stations with 'high' platforms. Parry People Mover PPM60 railcar in public service on a short mainline railway branchline in Stourbridge, near Birmingham, West Midlands. 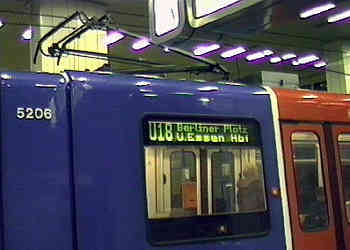 "Real-time" information display on a tram in Kassel, Germany. Some LRV's will have a definite front end with driving controls located here only. At termini they require a circle of track to turn around before commencing their return journey. Usually these will have passenger doors on one side only, typically the space not used by doors on the other side will be used to increase seating capacity. 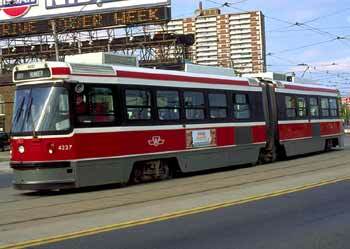 Toronto, Canada, streetcars with driving controls at one end and doors on one side only. Geneva, Switzerland; another city that uses modern trams with driving controls at one end and doors on one side: here we see the vehicles on a terminal loop. Turin, Italy. Left-hand running on a private right of way to allow vehicles with doors on one side only to use 'island' tramstop platforms located between the tracks. As a contrast other designs of LRV have driving controls at both ends, as a general theme these will have doors on both sides. Being 'double-ended' means that to change direction of travel they can either use a circle of track (ie: a terminal loop) or a stub terminus where the driver will walk to the other end and drive from what previously had been the 'back' (this is also possible at 'reversing points' where there will be a crossover track linking into the track for vehicles travelling in the opposite direction). There is a trade-off in that the extra doorways & driving controls on these 'double-ended' vehicles will create extra flexibility at the expense of passenger accommodation - especially seats. 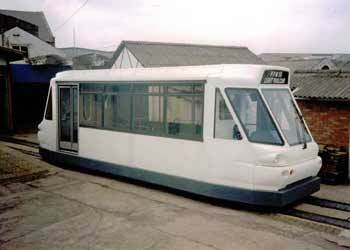 A 'double-ended' tram on the Blackpool-Fleetwood inter-urban line. Note the full range of lamps at what (currently) is the vehicles' 'back'. Seen on street trackage in Fleetwood. NB. Remember that in Britain we 'drive on the left'. A 'stub' end terminus - at Wolverhampton on the Midland Metro. The vast majority of light rail systems feature vehicles which are electrically powered with the electricity being sourced by means of a pantograph (or bow collector / trolleypole on a few older systems) from overhead wires. These wires can be hung from rosettes located on building walls, street lighting poles, dedicated masts or other means. In Britain it is a requirement that if one support fails the power sypply wire will still be adequately supported by adjacent overhead wire supports. 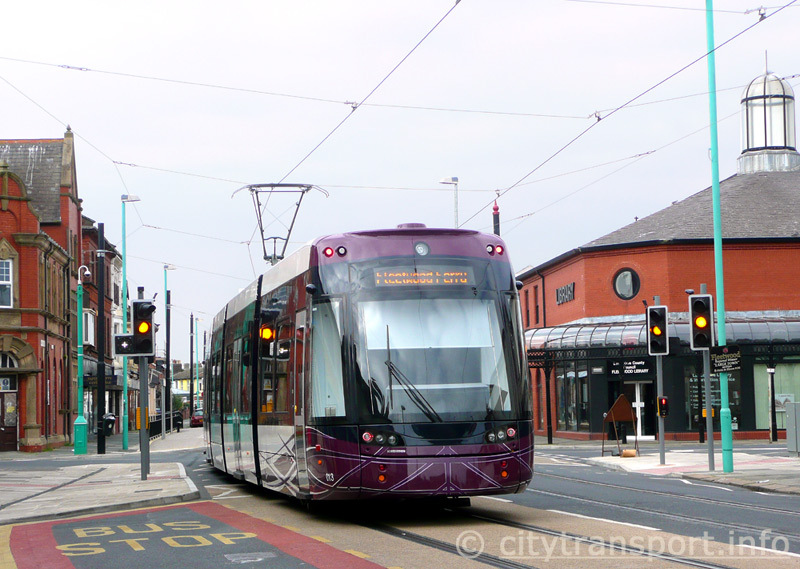 This requirement has lead to some new-build British tramways having overhead power supply systems which are functionally perfect but a visual eyesore. For reasons of visual intrusion it is usually preferred when the overhead wires are simple single wires (as seen in the Toronto image). 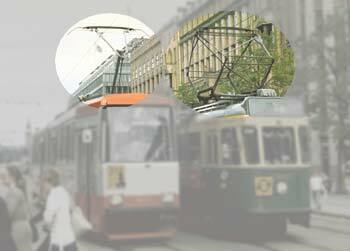 To meet the requirements for the contact wires to carry enough power for the trams to operate reliably some tramway systems use two very closely spaced overhead contact wires - perhaps with extra feeder wiring located out of sight (ie: underground). Typically the gap between the wires is so small that it is only seen from directly below, otherwise it looks as if there is just the one contact wire. This solution is only suitable for trams which use pantographs. Especially when away from the street environment many light rail lines emulate the mainline railways and use fully tensioned overhead wire systems. 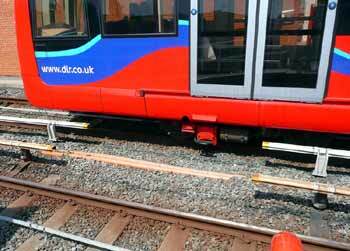 The tensioning counteracts the natural tendency of the metal wires to stretch and sag (expand and contract) as the weather (air temperature) changes, thereby keeping it at the required stiffness to ensure good contact with the pantograph as it passes below. Pantographs feature powerful springs (or air pressure systems) which to ensure reliable power collection exert an upward pressure on the wires - and if the wires are either too loose or too tight there is a risk of failure. However, especially when travelling in the street domain light rail does not normally travel fast enough to need such robustly engineered ways of doing things... although as some of the images below suggest, there are some locations where they still tension the wires as if they were for high speed trains! Helsinki, Finland. 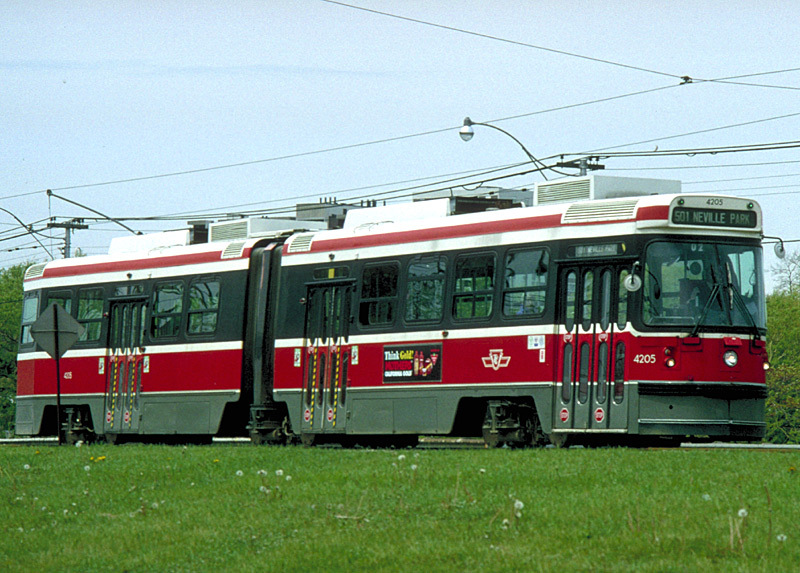 Only a few cities still use trolley poles - one of them being Toronto, Canada, as seen here. However concurrent with the introduction of new streetcars (currently underway) the system is to be converted to pantographs. Although very rare, there are locations where light rail / trams use a rigid overhead rail, rather than wires. This example comes from an opening bridge on Line B in Bordeaux, France. Image & license: Medocpeter / German Wikipedia. Free use with attribution. http://commons.wikimedia.org/wiki/File:Bordeauxbacalanbruecke5479.jpg Although very rare, a few streetcar systems used double overhead trolley wires (ie: two wires for each track) and streetcars fitted with two trolley poles instead of just the one. This image shows Cincinnati (USA); a similar arrangement applied in London (England) in the area close to the Greenwich Observatory. 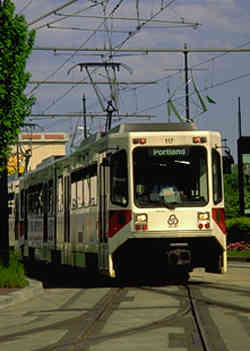 Normally trams and streetcars use the running rails as the return path for the electrical current collected from the overhead wire, Cincinnati used double overhead wires because when the horse trams were converted to electricity it was cheaper to have double wires than rebuild the tracks in the way required to prevent stray current from escaping and interfering with nearby utilities. In London trams which passed the Greenwich Observatory also used twin-wire overhead (rather than an earth return via the running rails) so as to reduce electromagnetic interference with experiments involving electrical measurements. The trams were switchable so that when away from the Greenwich area they could revert to using the running rails as part of the electric circuit. However railway electrification also affected the Observatory and as a result in 1927 the Observatory and its experiments relocated away from the Greenwich area. 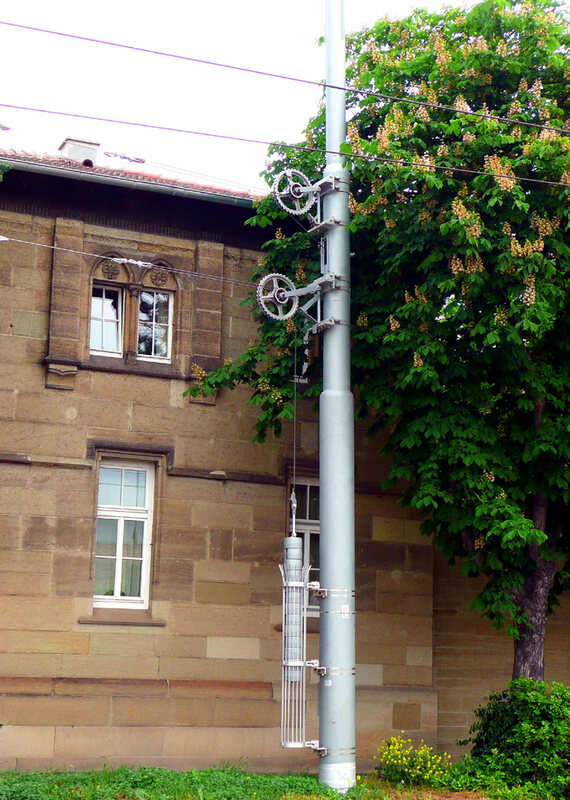 Railway style overhead wiring as seen within the street domain. Also visible on the far left edge of the image is a tensioning unit attached to an overhead wire support pole. The side elevation of an overhead wiring tensioning unit. Heavy weights keep the wiring taut. Whilst common on mainline railways and even some light rail services when operating in 'railway' mode - typically every few miles / km - it was a surprise to see this within the street domain. The topic of overhead wire support poles is also looked at on the page which looks at lawn track, creating green urban corridors and greening overhead wire supports. Regenerative braking is about reducing overall energy consumption. All moving vehicles need to stop sometimes and instead of slowing the vehicle solely by means of friction brakes (which wastes energy by turning it into heat) regenerative braking helps reduce the vehicles speed by using the electric motors to transform motion energy in to electrical energy which can then be captured and recycled for further use. With railways the trend is to feed the power back into the overhead wires (or electric rails) for other nearby transports to use; whilst some overhead wire powered light rail vehicles also do this others store the energy on the moving vehicle for it to use when accelerating again a short while later. Onboard energy storage systems vary but mostly use either batteries or capacitors. Batteries can usually hold more energy than capacitors but they are slower to accept that energy and attempts to increase that speed can be at the cost of shorter overall life. As it is after 7 - 10 years changes within their internal chemistry usually means that batteries are no longer able to store viable amounts of energy to be of use, so need replacing, which can be expensive!. By way of contrast, capacitors are excellent at rapidly accepting (and releasing) electrical energy and should remain viable for the entire 30+ year lifetime of the vehicle, but weight - for weight have a significantly lower energy storage capacity than batteries. A third method of energy storage is the flyweel. 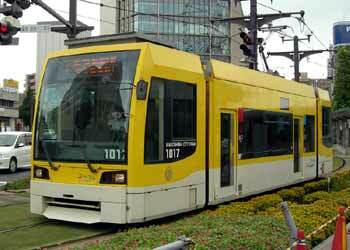 In 2005 a company named Alstom trialled using flywheel energy storage on a tram in Rotterdam, Holland. Nothing more is known about this, but further trials are known to be planned using a Williams MLC rotor flywheel - such as was originally designed for Formula One racing cars! Energy savings of up to 15% are expected. The Williams MLC rotor flywheel is made from a composite material which is said to make it safer than metal at high speeds. 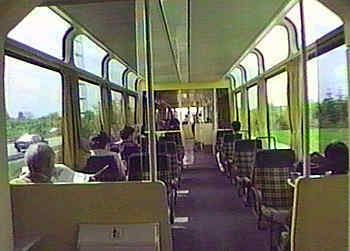 Flywheels are also used on the 'cabin' sized Parry People Mover which is seen elsewhere on this page. Once regenerative braking energy system became understood and proven viable it was realised that the same technology should permit a tram to travel short distances without any external power source at all. The terminologies for this varies, the most popular two terms are catenary free operation (CFO) and wire-free operation. This is looked at further down this page. A few light rail systems use third-rail power collection along all or part of the route. 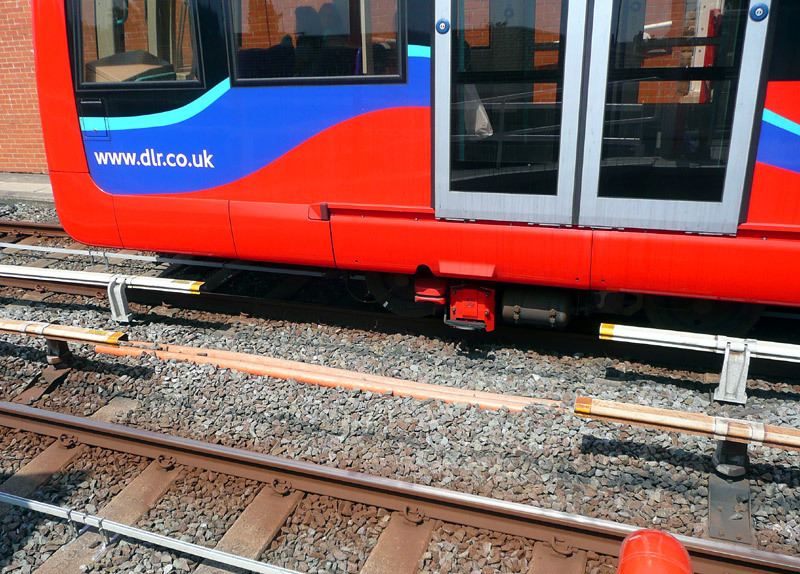 This requires an extra electrified rail (which is always live) to be laid alongside the rails used by the vehicles' wheels. For safety reasons the electrified third rail power system is not suitable for use within the street environment, as it usually involves high voltages - which typically are 600-660v dc old older systems and 750v dc on modern & upgraded systems. Amsterdam route 51 uses both 3rd rail left and overhead wire right power collection (seen at the changeover point whilst raising its pantographs). These 'twin system' vehicles do not operate along city streets. 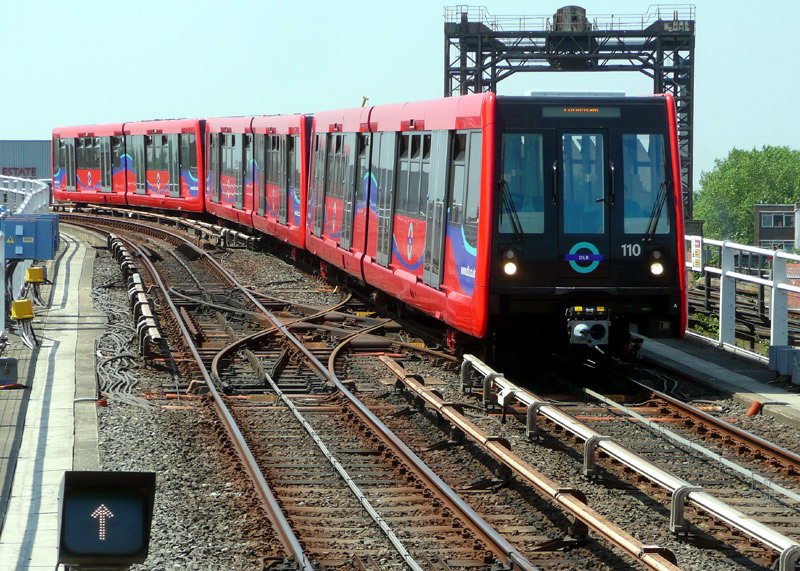 London's computer-driven Docklands Light Railway (DLR) features third rail power collection. Both the DLR and Amsterdam's route 51 (as seen above) use a third rail system whereby top of the rail is covered and the electrical power is collected from the underside of the rail. This minimises the possibility of electrocution should someone (eg: a trespasser) stand on the electrified rail and also makes the system very weather tolerant - especially in winter - unless the snow is so deep that the track and power supply rail are totally buried! The "heritage" styled Parry People Mover at a tramstop. The power supply rail is under the black and yellow diagonal stripe coloured cover. Former London DLR LRV, sold to Essen, Germany (because it did not conform to British safety requirements for underground operation) fitted with a pantograph for overhead wire power collection by its new owners. Most of these vehicles have also been repainted and are used on routes which include street trackage. The ultra light rail British built Parry People Mover features a flywheel-mechanical drive system, with the flywheel either being charged (boosted) at stops via a safe low-voltage third rail power supply or a low power on-board fossil fuel engine. Once charged the flywheel gives ample power to travel typical distances between stops. If desired then for steep uphill gradients and longer stop-to-stop distances the flywheel could also be continuously fed with power - although of course the electrified rail option would only be suitable for routes where it travels on its own private right of way (ie: NOT in the street domain). The flywheel-mechanical system was chosen in preference to battery electric traction because of the high cost and weight of the batteries, plus that batteries can only be trickle charged whilst flywheels can be charged much more rapidly. In addition, flywheels have, by comparison, an indefinite life and are much more effective (than batteries) in collecting reverse surges of brake energy (such as occurs during regenerative braking) - and require less complex electric control gear than capacitors. 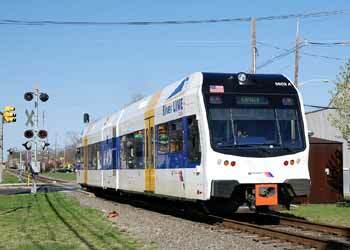 Another way to power light rail vehicles is from the road surface (or just below it). This concept is not new, apart from cable-systems (see below) in times past several electrical variants have also been used and although neither are still in use today recent years has seen the development (and introduction into full passenger service) of modern equivalents. Usually the primary reason for using ground surface power was / is to avoid the overhead wires, for reasons of visual aesthetics. Avoiding overhead wires offers some financial / civil engineering savings, especially when installing a new tramway into complex city centres. In particular the savings come from not having to install overhead wire support columns or to have to pay legals costs when negotiating with landlords to suspend the wires from adjacent buildings. However the expected financial savings from not installing overhead wires are typically more than offset by the higher installation and maintenance costs of the chosen alternative power supply system. The more successful of the historical systems was known as the conduit system. 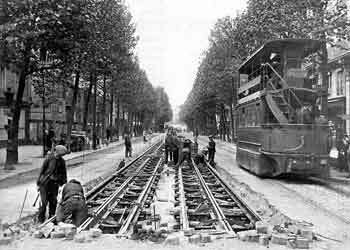 This saw trams (streetcars) using 'ploughs' to reach electric conductors buried under the road surface through a slotted rail centrally located between the two running rails. Although it worked well this system was very expensive to install & maintain, it required constant cleaning / removal of items which fell into it and despite often using twin conductors which meant that the running rails were not used for the return current it was still blamed for creating problems with stray electric currents interfering with the subterranean utilities - especially in rainy weather when water entered the conduit. In the winter ice sometimes prevented proper functioning, with the plough unable to make contact with the power conductor(s) and even sometimes physically blocked. The conduit system was extensively used in London, New York City (Manhattan Island only), Washington DC (both USA), Paris, France and other cities. In New York there were locations which had two physically different conduits (either both electric or one electric and one cable), for rival streetcar companies. The Parisian trams were replaced in the 1930's but in the other three cities named here the trams / streetcars (at least partially) survived into the 1940's and 1950's. It is a matter of conjecture whether had any of these cities kept their faith in their trams / streetcars the conduit system might have still have been in use today. In London the period 1903 - 1909 saw the London County Council install 250 miles (402km) of conduit. Much of this lasted to the end of the trams in 1952 and despite the claims that the electrified rails posed a danger at no time was a member of the public electrocuted. Even when heavy rain caused flooding (with boiling water) tram services were unaffected. The two power rails were buried well beyond the reach of articles such as umbrella tips - the slot was 1" (2.5cm) wide, the Z-rails were 7" (17.7cm) deep and the T-rails were 6" (15.24cm) apart and deeper than the bottom slot of the slot rails. A mile of conduit track cost £20,000 whilst a mile of track with overhead wire cost £10,000 (LCC figures). Another city which used a conduit system was Budapest, which is the capital city of Hungary. Rather than locate the conduit centrally between the running rails, one of the running rails featured two rails with a small gap between them through which the plough (power collector) could reach the power supply conductor rails. 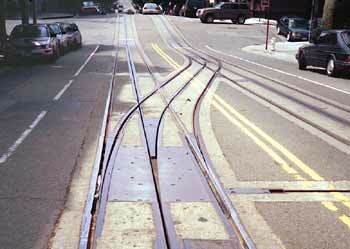 The use of two conductor rails also had the advantage of eliminating stray currents. This system started being used in 1887, when electrification of horse tramways began, but by 1923 had been withdrawn in favour of overhead wires. Some of the original conduit trackage still remains at the tram depots. In addition to unwanted objects falling through the conduit slot Budapest is also said to have experienced problems with constant friction causing the wooden ploughs to wear out too quickly. Schematic diagram of the conduit system used in Budapest city centre from 1887 (as a pilot operation) 1889 (full scale use) until 1923. The twin conductor rails were accessed via a gap in one of the running rails. Historic image - copyright has expired / Wikipedia encyclopædia. 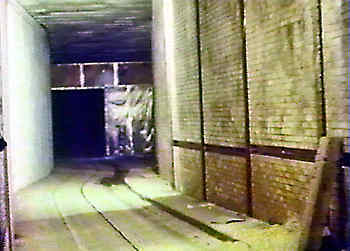 http://commons.wikimedia.org/wiki/File:Tram_VoieTramwayCaniveau_AvAntin.jpg Surviving conduit trackage in London's Kingsway tram subway. (Video-still courtesy of Online Video). http://en.wikipedia.org/wiki/Conduit_car A Wikipedia page with more information about the conduit system. http://dewi.ca/trains/conduit/index.html Some web pages by Dewi Williams with more information (& many photographs) on London's Kingsway subway and conduit trams. http://dewi.ca/trains/2004/NCTM/index.html Some web pages by Dewi Williams with more information (& many photographs) taken at the National Capital Trolley Museum, Washington, D.C. which includes a photograph of a plough (plow) from a Washington conduit streetcar. http://www.nycsubway.org/nyc/tracks/ Some web pages by Joe Brennan with more information (& many photographs) on the former Manhattan Island conduit streetcars. The less successful of the historical systems was the stud system which started being installed in several towns and cities in the late 1890's. 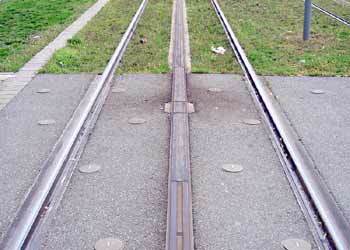 One example was Paris, France, where the studs (standing 5mm proud of the road surface) were located every 2.5 metres along the centre line between the two running rails. There were actually several different stud systems (Claret-Vuilleumier, Vedovelli, Lorain, Diatto and Dolter). For safety the studs were only supposed to have been energised when a skate - located under a tramcar - passed over them, unfortunately however they sometimes remained live when the tramcar had passed, with unpleasant results for pedestrians and often fatal results for dogs. One of the British cities to have used the stud system was Wolverhampton, where the dancing horses become almost legendary! In Wolverhampton the trams were fitted with a 12ft (3.65 metre) metal skate beneath them and six pairs of electromagnets. The studs in the street were approximately 9ft (2.74 metre) apart and as the tram passed overhead the magnetic field pulled up the stud, making it live. The studs were supposed to drop down again after the tram had passed, by when they would no longer be within range of the electromagnets. In theory when dropping down the studs should have automatically ceased to be live but as a safety measure the trams were fitted with a trailing chain which shorted out any studs that had stayed live. Something which was seen as a drawback (especially by the travelling public) was that the incompatibility with overhead wire powered tramways prevented through services to and from neighbouring towns. To get around this some existing trams were converted to to work on both systems, but it was then found that the one tonne weight of the stud power collection system was so heavy that these trams were underpowered. However, incompatibility with neighbouring systems was not the most serious issue which Wolverhampton's trams faced. What Next When Proprietary System Creators Cease Trading? Wolverhampton used the Lorain stud system. When in the early 1920s it wanted to upgrade its track and electrical infrastructure it found that with the Lorain company having ceased trading many years earlier it would either have to find a manufacturer who could clone existing Lorain equipment or choose a different solution. With the running costs of the stud contact trams being approximately twice that of overhead wire trams it decided that converting to overhead wires would be the only financially and technically viable solution. The issue was that the Lorain system was a proprietary technology whereas overhead wires are universal with many competing equipment suppliers. This page includes information about many proprietary power supply solutions which were created to act as alternatives to overhead wires. It could easily be that in 20 years from now some of these will no longer be supported, spare parts will no longer be available and new rolling stock not able to be used without also installing a new power supply system. Meanwhile, overhead wires and pantographs can be purchased from many sources located on most major continents; this much reduces the likelihood of spare parts becoming unobtainable in years to come - and virtually guarantees the compatibility of new rolling stock - no matter which company builds it. As an aside, the primary reason why the stud system failed and is no longer used anywhere 'today' is the inability to prevent the studs from remaining live after a tram had passed over them. It is a matter for conjecture whether the stud system would have still been in use 'today' had present-day power supply control technologies to ensure proper safe functioning been available 100 years earlier. 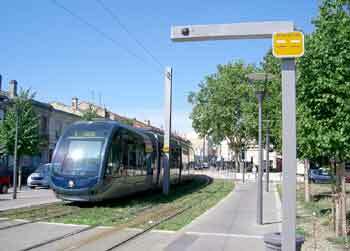 In December 2003 a road surface power supply system came into use on a new tramway in Bordeaux, France, this being one of the "other cities" which had previously used the conduit system ("caniveau" in French) and having liked it local people wanted to follow the same principle again. However the caniveau was declared to be unsafe and overhead wires were proposed instead. After complaints from both the public and the French Ministry of Culture a modern-day version was developed whereby the conductors (powered rails) are on the surface with electrical power being collected by skates located under the tramcar. This system is known as "APS" or Alimentation par Sol (ground power). When the tram system first opened there was 12km of APS powered tramway on a network comprising several tram routes of approximately 21km in total length; since then there have been many extensions involving both the overhead wire and APS power supply systems. 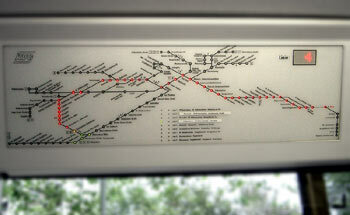 It is not intended to keep track of the network as it expands. 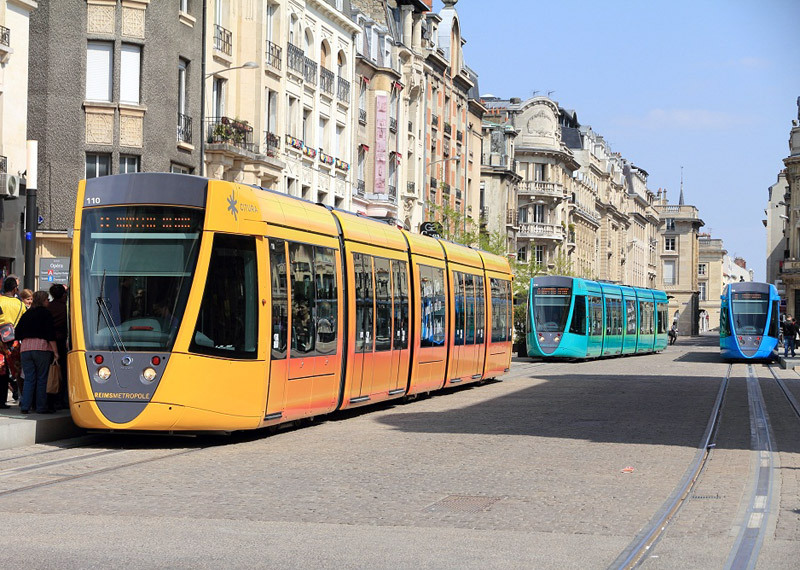 Some sections of APS are located in neighbouring communities towards the outer edges of the tram system, and not solely in Bordeaux city centre as some sources suggest. This is to keep people happy in the adjoining communities which are in different local government areas who feel that despite being smaller communities they are of equal importance and if it is good enough for their big city neighbour then their community should have the same as well. APS combines aspects of both the conduit and the stud systems. Like the conduit it uses twin power rails (rather than the running rails for return current) and like the stud system it road surface equipment both stands very slightly proud of the road surface and is only electrically live when the tram is passing over it. The power rails are typically 11 metres in length, and comprise an 8 metre segment that is actually powered flanked on either side by 1.5 metre neutral sections. Effectively this means that when installed in to the ground the combined length of the neutral sections are 3 metres. Power supply switching boxes are located next to every other insulated segment (ie: every 22 metres) these feed the two adjacent sets of power rails. The equipment in these switching boxes is modular and designed to be easily and quickly replaced. They include switching contacts which connect the power rails to the power supply when a tram is passing by. For safety the proper functioning of these contacts is essential, especially when switching to the off mode when a tram is leaving a section of power supply rail and if powering (ie: accelerating) will be drawing much current. Therefore to ensure long term reliability it is recommended that the power supply switching boxes are regularly replaced as part of longer-term general maintenance cycles, with them then being overhauled at service centres before being returned to active use. Towards the centre of each tram are two sets of power collection skates, next to which are antennae that send radio signals to energise the powered rail segments as the tram passes over them. For reasons of safety at any one time no more than two consecutive powered rail segments under the trams should be "energised", with variations to this seeing automated safety cut-outs being activated. These then switch off the offending power rail segment(s) - so that it/they will not switch on again - until being reset by a maintenance person. For this reason the trams also have batteries which will allow them to travel up to 150 metres at 3km/h (ie: very, very slowly). If many adjoining power supply rail segments have been switched off in this way then the distance which needs to be travelled in battery mode could be greater than their stored energy capability - and it can, and at times has, resulted in trams becoming stranded on unpowered sections of track. 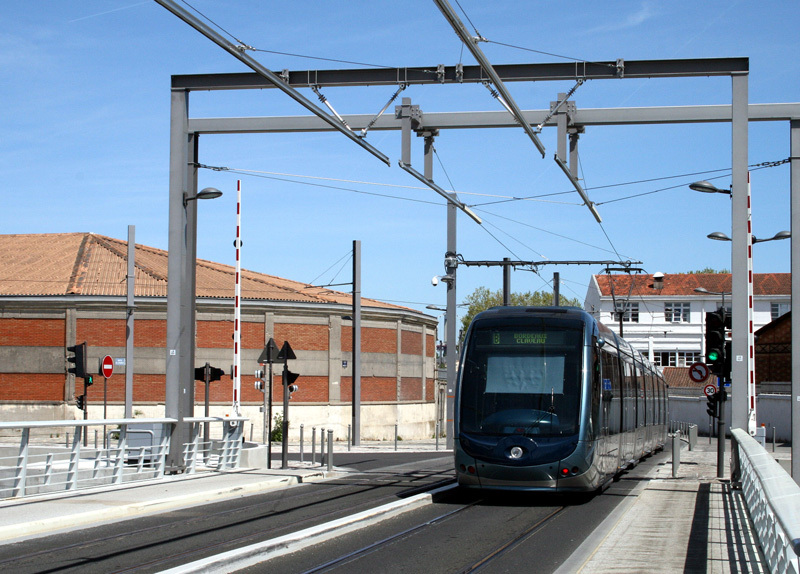 Before use in Bordeaux the APS system was tested (and proven viable) on a short section of reserved track tramway in the French city of Marseilles. Nevertheless teething problems saw the system being so temperamental that at one stage the local Mayor issued an ultimatum that if reliability could not be guaranteed then the APS would have to be replaced with overhead wires. Although things did improve very considerably, in October 2005 it was announced that 1km of APS equipped tramway was to be converted to overhead wires. At that time media reports were suggesting that if the system proved its reliability then there would be a string of other cities looking to use this power supply system. To this end, and despite the teething problems, the city of Bordeaux is reported to have agreed to help market the system - in return for a financial kickback from any future sales. Problems have been variously described as: drivers forgetting to raise the power collection skates when they switch to the overhead wire power supply system; no electrical contact when lowering skates if there is gravel on the track (resolved by fixing brushes at each end of the trams); water logging after heavy rains where the water does not disperse / flow away quickly enough and that possibly the safety cut-outs were too quick to operate with issues about restoring power afterwards. Issues with waterlogging is not a new phenomena - for instance the British-style conduit system which was initially used in Madras, India, failed because it could not cope with monsoon flooding of the conduit. Despite initial hopes that the APS system would be cost competitive with overhead wires - and far cheaper than the older type of conduit - it seems that the fixed infrastructure is roughly 3 - 3½ times more expensive to install and 50 times more expensive to operate. Apparently the first few years of operation saw €500,000 being spent annually on bus replacements for when the APS system suffered temporary failures. 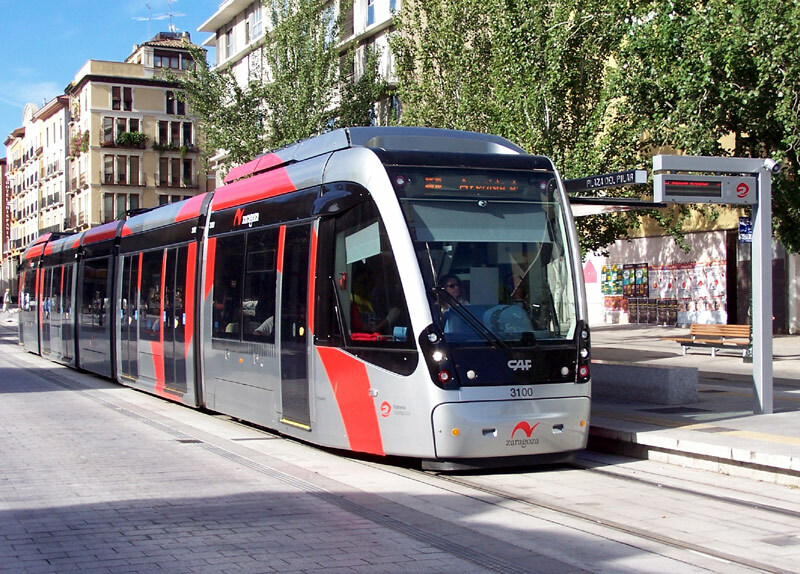 In addition to the cost of the street infrastructure the APS power collection skates and associated wiring, etc are reported to add about €100,000 to the cost of the trams. Because of the cost some English-speaking commentators suggested that "APS" stands for "Amazingly Pricey System". 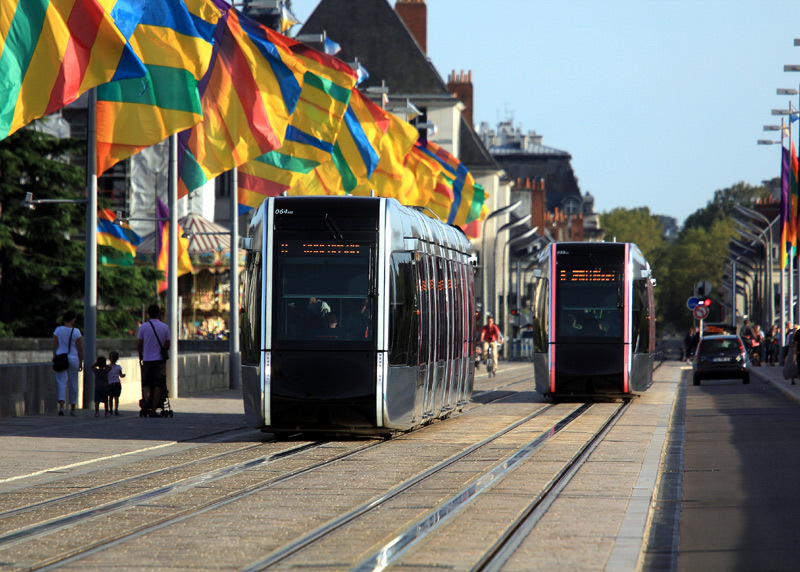 In December 2006 it was revealed that in the previous year the number of daily journeys on the Bordeaux tramway system had soared by as much as 26% - reaching 180,000 - this being a very commendable 90% of the projected 200,000 daily journeys for phase 1; that the three tram routes were now carrying more passengers than the entire Bordeaux bus system and that reliability had reached 99%, which was especially significant in light of the teething problems that had been experienced with the APS ground power system. 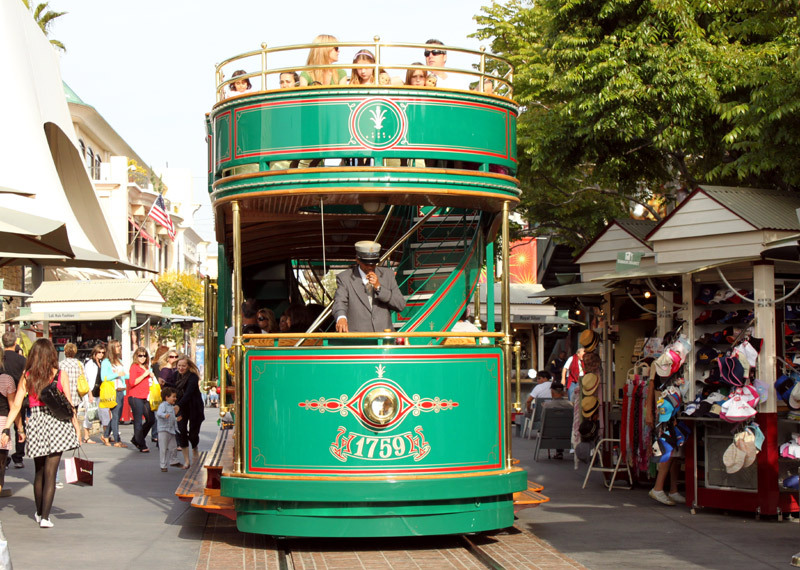 Passengers travelling in the correct part of the tramcar can hear the APS power collection shoes, this is especially noticeable at the transition points between the sections of powered rail and the neutral sections, and where they pass over the insulating joint boxes. This mono soundclip was recorded using a mobile telephone. Click the speakers icon to hear a 630kb file named 'APS1.mp3'. Also heard is the announcement for Bergonié tramstop. A section of APS track showing the neutral sections at the end of the powered segments plus one of the insulating joint boxes which mechanically and electrically join the APS rail segments. 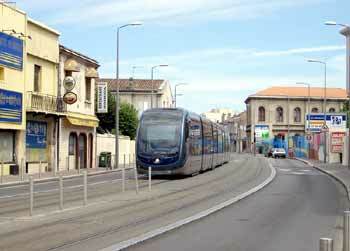 A tram travelling on APS arrives at the Gaviniès tramstop which is also a transition point between APS and overhead wires. Also visible is an end mast for the overhead wires. The sign on the CCTV post tells the tram driver to travel in APS mode. Using APS whilst travelling on a suburban street near the Roustaing tramstop. Quietly gliding through place de la comédie clearly showing its folded down pantograph. Clicking any of the four Bordeaux images above will lead to a dedicated page showing more (and larger) Bordeaux APS images (plus more soundclips) in a popup window; alternatively clicking here will open the page in a new full-size window. 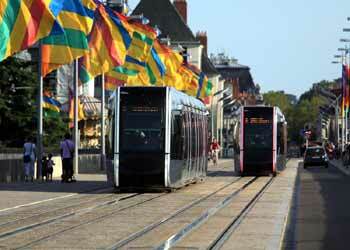 Additional images of the Bordeaux tramway and APS can be found on the Light Rail Transit Organisation (LRTA) website, http://lrta.org - - from the main index select "photogalleries", and from the country list (further down the page) select France. Images displayed include a section of APS test track (on ballasted formation where the power rail and running rails stand proud of the surface) and the pick-up shoes under the tram. With APS having finally become seen as working reliably more cities in France (and beyond) have chosen to build new tram networks which use it - either over part of the route or in some cases along the entire line. One location which probably regrets having chosen batteries instead of APS is the French city of Nice. Batteries are used on a 500 metre unpowered section of track across two historic squares in the city centre, and in 2014 the batteries were cited as the cause of two fires on their trams (18th January and 6th February). Apart from visual aesthetics Nice needed / needs a wire-free solution because some floats which take part in the annual carnival are so tall that they would make contact with the overhead wires. The Angers system opened in June 2011. 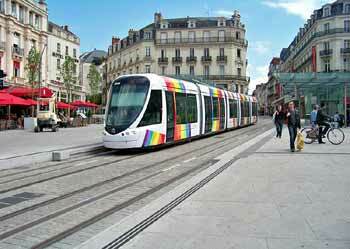 Here one of the rainbow liveried trams is seen whilst undergoing pre-opening staff training. Image & license: POMPIERS / Wikipedia encyclopædia. Public Domain. 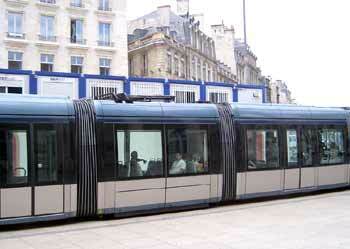 http://commons.wikimedia.org/wiki/File:Tram_ral_49.jpg The Reims system opened in April 2011. Here some of the pastel coloured trams are seen on the opening day at the Opéra tram stop. As an aside, Of the 18 new trams in Reims, 15 are painted in pastel colours while the other three are in grey but destined to be in publicity (advertising) liveries. The colours are: Fuchsia (pink), Lavender (purple), Scarlet (red), Turquoise, Azure (blue), Pistachio (green), Mandarin (orange) and Citron (yellow). Orleans line B opened in June 2012. Here an APS powered tram is seen whilst undergoing pre-opening trials in the same month. 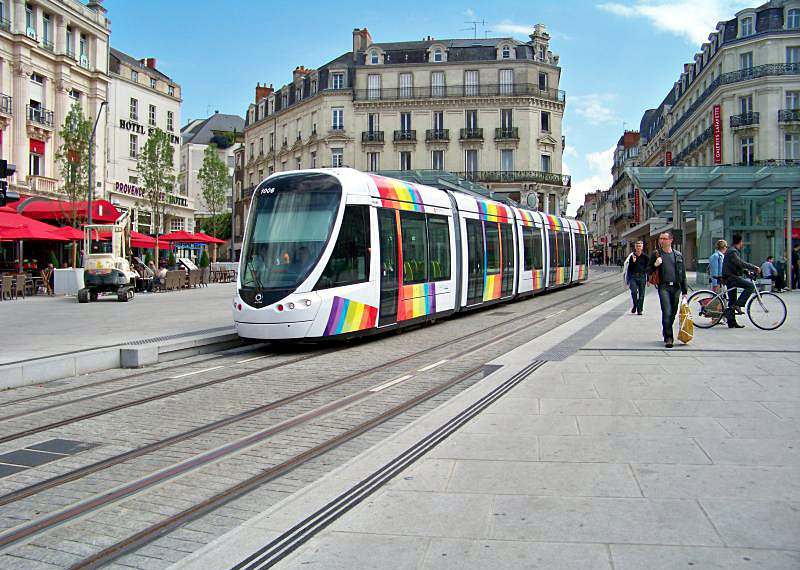 http://commons.wikimedia.org/wiki/File:Tramway-ligne-2-Orleans_aux_essais.jpg The Tours system with its very distinctly styled trams opened in August 2013. Here two tramcars are seen on Wilson bridge whilst crossing the River Loire. 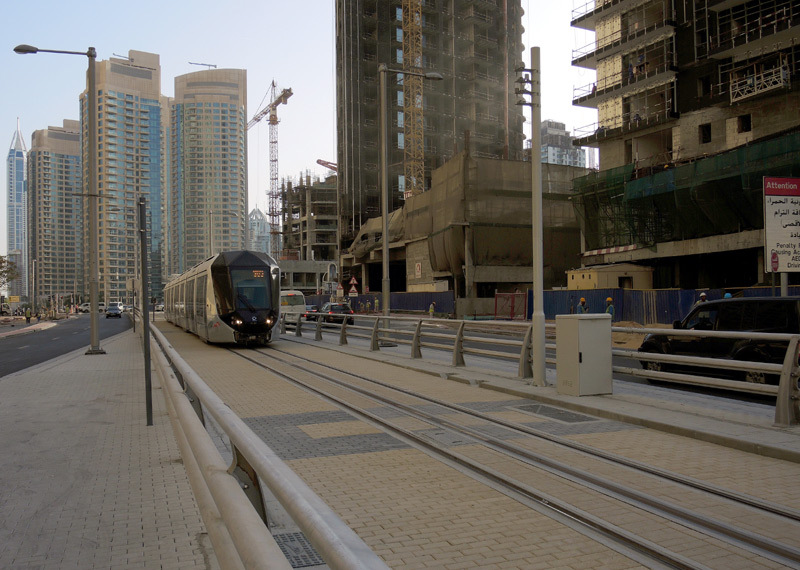 Planned in 2008 but with opening delayed after a temporary halting of building works (due to problems arising from the 2008 financial crash) the first section of the Al Sufouh tramway in Dubai, United Arab Emirates tramline opened in November 2014. 10.6km (6.6 miles) in length, the entire tramway (except the depot) uses APS. 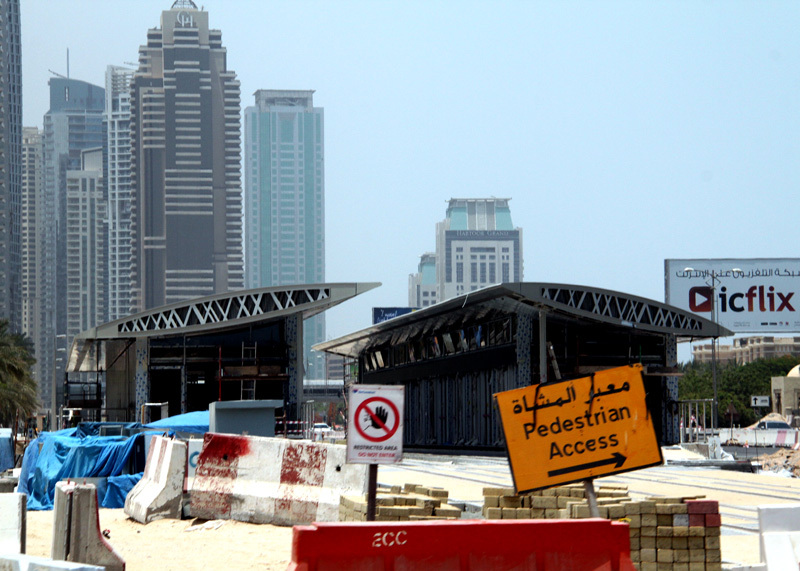 Because of the hot climate Dubai uses a climatically localised APS version, where (for instance) the buried electrical switch boxes are also artificially cooled and the trams are fitted with brushes to sweep sand off power rails in front of the power pick-up shoes. Phase one has 11 stations which, because of the local climate, are both fully air-conditioned and feature platform screen doors. For added safety a new Supervised Vehicle Operation (SVO) mode ensures accurate station stopping and safety during passenger transfer. The initial fleet consists of 11 trams that are 44 metres in length and equipped with air-conditioning designed to cope with high humidity and temperatures as high as 50° C / 122° F. The ticketing system uses smartcards, so passengers must remember to use the smartcard readers which are located at stations at each end of their journey. There are two interchange stations with the red line of the metro and providing the smartcards are read again within 30 minutes passengers benefit from free transfer. However separate fares are charged when interchanging with the Palm Jumeirah Monorail. Gold class passengers benefit from 1+1 seating, but they also pay a much higher fare. Silver class includes a section reserved for women and children. This is not segregated and often this reservation is only enforced during ticket inspections. The trams travel somewhat sedately, never exceeding 50km/h (31 mph). Unlike most tramways it is a criminal offence to cross the tracks - except at locations where signage expressly permits this. If caught the fines for disobeying this ruling are eye-wateringly steep! Phase two will extend the tramway by 4km (2.5 miles) and add an additional 14 trams to the fleet plus 8 stations. This is expected to open in 2020, and a phase three in 2025. 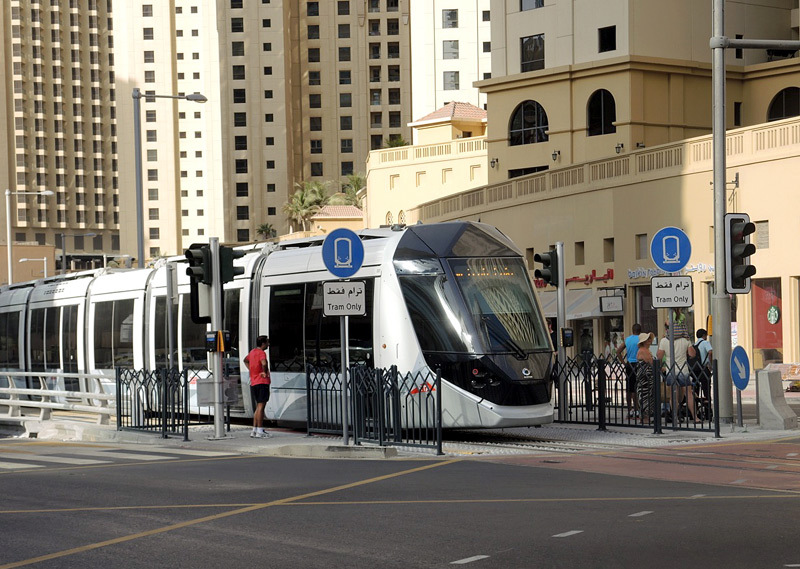 A new city called Lusail in Qatar is also building a new APS powered tramway. The network will consist of four main tram lines with a total length of 33.1km, of which there will be approximately 8km single track and 25km double track. APS will be used on the ground level and elevated sections of line which includes a 0.5km section between two high-rise buildings. However the approximately 7km underground section will be powered from overhead wires. There will be 37 stations (26 ground level, 10 underground plus one elevated). Initially there will be 35 trams which are 32 metres in length. The first of these is expected to arrive in 2017 and with construction well underway the system is planned to open in stages between 2018 and 2020. Two Alstom Citadis 402 trams at the tramway depot showing their distinctive jewelled angular noses. Note the overhead wires - apart from here the entire tramway uses the APS power supply system. 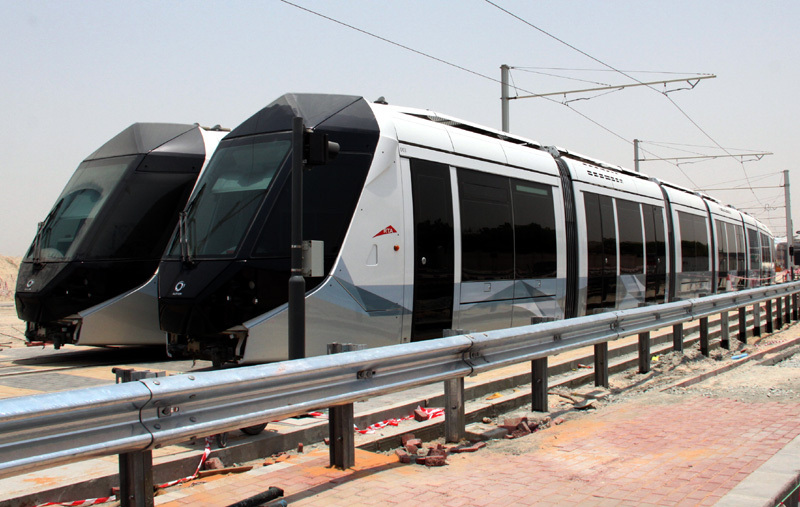 http://commons.wikimedia.org/wiki/File:Dubai_Alstom_Citadis_402.jpg The Knowledge Villa air-conditioned tram stop of the Dubai Al Sufouh tramway as seen in 2014 whilst still under construction. Both images: Maurits90 / Wikipedia encyclopædia. Public Domain. Trams powered by APS under test in Dubai. Both images: Iantomferry / Wikipedia encyclopædia CC BY-SA 3.0. 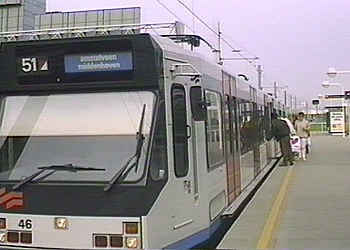 In 2009 the Brazilian city of Brasilia was added to the list of cities which was expected to use APS on a new tramway.. However, whilst construction works did commence, after 11 months a court of law ordered that the works be halted, citing allegations of financial irregularity. In 2012 the government cancelled the project. In 2013 a 28km (17.4 mile) six-line 32 tram system was announced for the Brazilian city of Rio de Janeiro. This tramway will use APS over 80% of its route and supercapacitor onboard stored energy for 20% of the route. The first tram arrived in June 2015 and whilst it was built in France most of the fleet will be built locally in a factory which will be well-poised to build trams for other South American cities. The first part of the system opened in June 2016, in time for the 2016 Olympic Games. 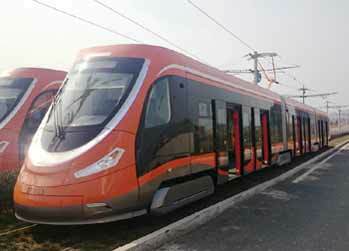 Also expected to open in 2016 will be a 10km tramway with 27 stations and 14 trams in the Ecuadorean city of Cuenca. 2km of APS will be used in the historic city centre of this listed UNESCO World Heritage Site. Note that as yet (November 2015) only some of these have been exploited commercially and even those that have are still new-ish. Even though something works wonderfully when on the test track and in its first few years of service it may be that as the years progress some foibles will become apparant. Battery longevity and potential replacement costs are especially age-related issues which commercial esperience with buses has shown has the potential to become a serious challenge. The PRIMOVE induction power supply system is is marketed by Bombardier. It is installed under the road along (some of) the transports' route, with the vehicles drawing power as they travel over it. At first this was conceived with trams in mind however the technology has also been ported over to rubber tyred road vehicles, including electric buses. The trails with trams also involved the Mitrac energy storage system which was created to facilitate regenerative braking but also allows trams to travel short distances without an external power supply. Mitrac stores energy in a double layer of ultracapacitors which are located on the vehicles' roof. This is then released when accelerating, reducing overall energy consumption and also boosting performance. For trials with buses an entirely new Primove high power lithium-ion battery energy storage system has also been created. 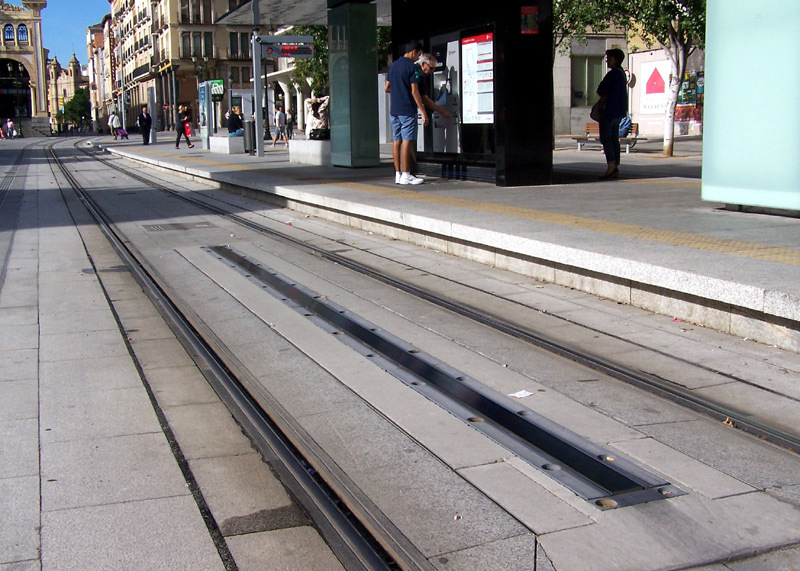 For trams it is sufficient for the Primove inductive loops to be located between the tracks / above the sleepers at tram stops and on uphill gradients. For street trackage they would need to be covered by a 40mm layer of non-conductive material such as resin, asphalt base or non-reinforced concrete. 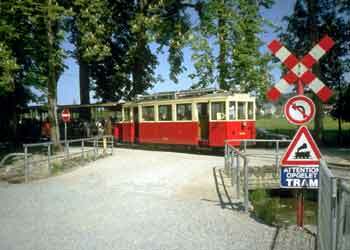 For private rights of way which are not used by rubber-tyred transports grass (ie: lawn track) is another possibility. The charging loops are eight metres in length and fed by an inverter which transforms 750v DC into 200 kHz AC. They are only 'live' when the transport is over them. The transmission efficiencies of 90% - 95% are claimed to be only 2% less than those achieved with physical contact systems. Elsewhere the tram is powered using stored energy. For buses the buried Primove inductive loops are placed at bus stops and dedicated charging locations. 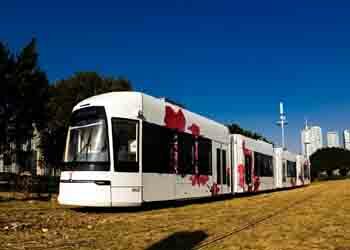 The first pilot demonstration trials within the public domain involved a specially modified Bombardier low-floor tram and an 800m section of tramway that is only used in public service during events at the exhibition centre in Augsburg, Germany. This proved the system’s reliability under all environmental conditions and full compliance with all applicable codes and standards for electromagnetic compatibility. A May 2012 press release (link below) discussed the success of these trails which began in 2010 and also revealed that trails had been underway with an electric road vehicle and that a new Centre of Excellence for electric mobility technology had been built in Mannheim. Development works with buses have involved partnerships with various bus manufacturers, as detailed on the pdf format data sheets - see below. 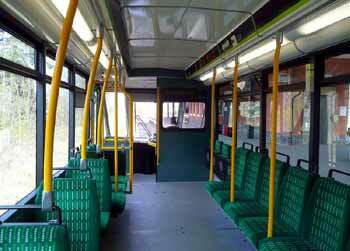 Induction powered electric buses are looked at on Electric Buses page 2. *The first four trams had been delivered by summer August 2014 and in conjunction with the 2nd Summer Youth Olympic Games which were held in Nanjing from 16th - 28th August it was possible to place two of them into passenger revenue service on the Hexi line. This service was specially operated for the games and temporarily ceased when the Games ended. However full commercial services have now commenced. The Primove nickel manganese cobalt (NMC) lithium-ion batteries have been specially created to maximise performance and include an advanced thermal conditioning unit which maintains its ideal temperature, enables rapid charging and recovery of braking energy recovery plus has an expected life span of up to ten years. In October 2015 a tram equiped with Primove batteries and Mitrac propulsion system created a new endurance record by travelling 41.6km (almost 26 miles) powered solely by its Primove battery pack in combination with a Mitrac propulsion system. This was in Mannheim, Germany. The best place for more information is the Primove website - the first link below leads to a page on the Primove website from where it is possible to download fact sheets in pdf (portable document) format which depending on computer operating systems may require the installation of the free Adobe Acrobat (or equivalent) pdf reader. ACR evoDRIVE which uses supercapacitors and is primarily aimed at regenerative braking, but is also advertised as being suitable for up to 100 metres of wire-free operation. ACR freeDRIVE which both supercapacitors and batteries. This variant both recovers braking energy when the tram is slowing down and is charged whilst calling at tramstops. It is advertised as being suitable for up to 1.4km of wire-free operation. ACR is used in full commercial service on 1.6km of the TUSSAM Metrocenter Line T1 (tramway) in Seville and on Line 1 of the Zaragosa tramway. It will also be used along four separate wire-free sections totalling 4.7 km in length of the new 15.9km tramway in Grenada. Although construction of this tramway was delayed by the Spanish economic crisis it is now expected to open in March 2017. Prior to the use of ACR tram services in the Cathedral area of Seville were stopped and the overhead wires removed so as to not interfere with the traditional Easter festival parades. ACR is advertised as being compatible with trams from other manufacturers and being for both new build tramways or as a retrofit to existing tramways. Zaragosa Urbos 3 tram in wire-free mode at the Murallas tramstop. showing the ground-level power collection rail. A wire-free tramway which uses ACR freeDRIVE is being built in Kaohsiung, which is the second largest city in Taiwan. The eventual aim is for a 22.1km (13.7 miles) circular system which has 36 stations. Phase one is 8.7km (5.4 miles) long with 14 stops and expected to open in October 2015 (but was still closed at the time of this November 2015 page update). Phase two will be 13.4km (8.3 miles) with 22 stops and is expected to open in 2019. The first of the initial nine trams arrived in September 2014. This line will be completely wire-free, with the onboard freeDRIVE battery being flash charged in about 30 seconds by 750V dc charging points that are located at every stop. Other system features include regenerative braking and careful planning of the route plus all interfaces with other traffic (including traffic signal preemption) to minimise delays. One unusual but very passenger-friendly feature is that the smartcard ticketing will allow passengers to touch in and out at each end of their journey either at stations or on the trams. Star-of-Cianjhen Bike Bridge and the LRT Station of the same name (Star of Cianjhen Station, KMRT Circular Line). The bridge which crosses the tracks is a cycleway / footpath. 9F%E8%88%87C3%E8%BC%95%E8%BB%8C%E7%AB%99.JPG CAF Urbos 3 tram at C2 Station of Kaohsiung LRT Circular Line. A larger view showing the folded down pantograph and overhead power supply rail can be seen at this link. The 21 CAF Urbos 3 trams which are used the British Midland Metro light rail line that operates in the English West Midlands region are to be fitted with high power lithium ion batteries for wire-free operation on several sections of tramway that are to be built in Birmingham city centre and environs. Although the batteries are expected to need replacing every 7 years they were chosen because the route includes a steeply graded section where it was felt capacitors would not be robust enough to power a tram. 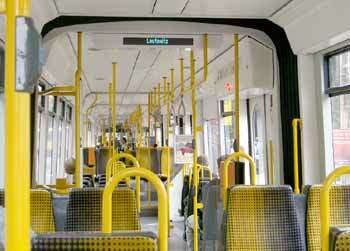 The batteries will be recharged whilst travelling on sections of line which are equipped with overhead wires. The plan is that battery operation will commence when an extension opens in 2019. Devised by Ansaldo Trasporti this ground level power supply system was marketed under name of Stream, which was an acronym that stood for Sistema di TRasporto Elettrico ad Attrazione Magnetica (System of Electric Transport by Magnetic Attraction). Although also suitable for trams the development works involved two electric buses - one each 12 metres and 18 metres in length. The technology was based on a glass fibre duct being installed in the road so that a power supply module containing two metal conductors could be located level with the the road surface. To ensure safety and avoid the possibility of electric shock the conductor that carried the live power was split into short sections which would only be energised when a bus was actually over them. The system worked by the power collection shoes on the buses magnetically attracting a flexible copper power supply strip located inside the power supply module to flex upwards to the underside of the road surface conductors, which then became live. 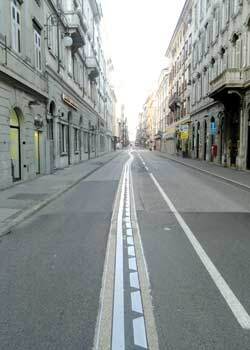 Since this system provided both electrical polarities so (theoretically) its installation on a new build tramway would not have also required electrically isolating the running rails (tracks) from the rest of the streetscape - thereby reducing some of the initial installation costs. In 2000 trials of the Stream system were conducted in the Italian city of Trieste. However it seems that these trials coincided with a change of local government, and whilst the old politicians were interested in seeing the system expanded to more routes the new politicians were not. Perhaps at least in part this was because the trials were on one of the cities' busiest bus routes and there was some disruption, especially when it was being installed. Included in the problems which the trials identified were issues related to the fragility of the road surface glass fibre ducts, the need for more frequent transformers than with overhead wire powered transports and that the metal of the road-surface power conductor was slippery, especially when wet. Stream is also looked at on Electric Buses page 2. Stream has now superseded by a technology called Tramwave® and in 2012 the disused experimental power supply system was removed from the streets of Trieste. 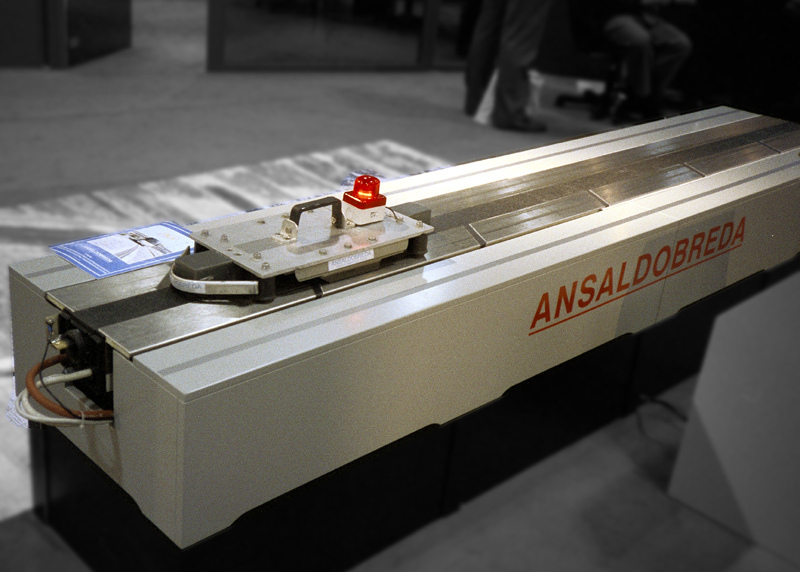 A demonstration section of the experimental 'Stream' road surface power trackage and collection skate as seen at the 1999 UITP exhibition in Toronto, Canada. On this display version the red light on the skate illuminates to demonstrate that power (low voltage in this instance) is being received. Stream road surface power trackage in Trieste. providing author is named and (C) riproduzione vietatato is quoted. Tramwave® represents an advance on the former Stream technology. It is being marketed by Ansaldo STS / AnsaldoBreda and their promotional material says that it can be integrated in any make or model of tram, regardless of the supplier. 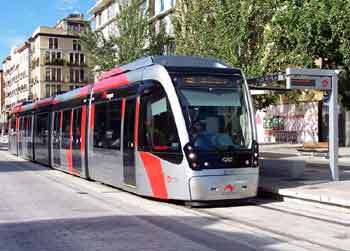 In addition to a 400m test track at their Naples, Italy factory it has been installed on a 600m section of street tramway located along Via Stadera in the Poggioreal area of Naples. It consists of modular power supply sections which are 3 metres - 5 metres in length. The steel contact plates are 5 metres in length and power reaches the tram via bogie-mounted retractable copper and graphite shoes. Only the section of contact plate underneath the vehicle is energised at any time. 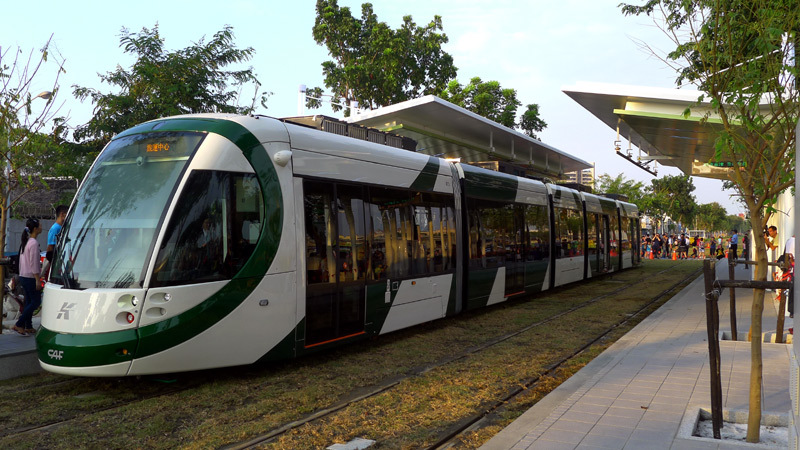 In 2013 it was announced that Tramwave® will be used on an 8.7km (5.4 mile) wire-free tramway which has 14 stops and uses 10 trams in the city of Zhuhai in Guandong province, China. 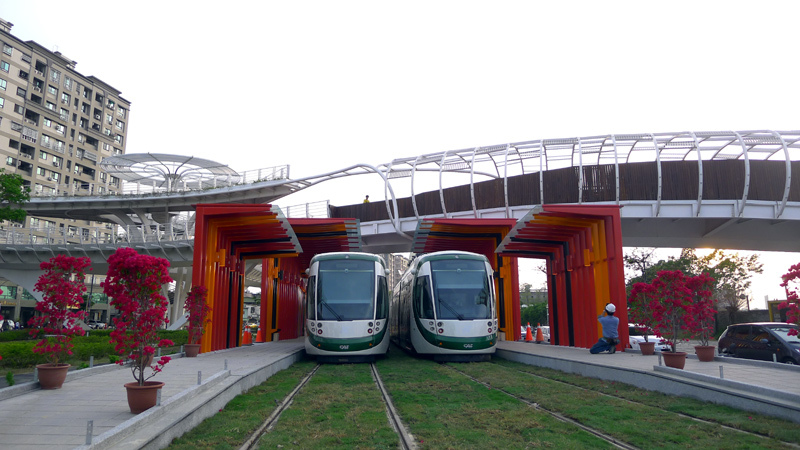 The first two trams arrived in China in October 2014, the rest of the fleet was built locally. 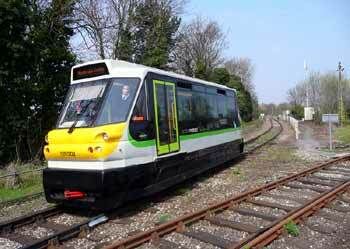 Trial services commenced over part of the first line in November 2014 with the rest of line 1 opening in summer 2015. By early 2016 the 6km (3.7 mile) line 2 and 4.8km (3 mile) line 3 should be ready too. Zhuhai is an area that is prone to typhoons which would potentially damage overhead wires, so the preference for a ground level power supply system is not just for visual reasons. Sitras HES (Hybrid Energy Storage) is the system being marketed by Siemens. Designed for both new build and as a retrofit to existing trams, this system combines NiMH (nickel-metal hydride) batteries and an MES (Mobile Energy Storage) device that features double-layer super capacitors to provide up to 2.5km of wire-free operation. The batteries are used for steady speed whilst the supercapacitors for acceleration. Sitras HES can works as both an adjunct to or instead of overhead wires. When working with overhead wires its primary benefits include absorbing regenerative braking energy (which can reduce overall energy use by a claimed 30%) and elimination of power spikes when several trams accelerate at the same time. Regenerative braking is also used in wire-free mode, with the HES also being charged at what is known as a Sitras LCU (Local Charging Unit). A LCU is a short section of overhead conductor rail which can be placed at stations and other places where trams regularly stop for an approximately 20 second top-up recharge. Since November 2008 Sitras HES has been in use on a tramway between Almada and Seixal, two cities which are located to the south of Lisbon, Portugal. 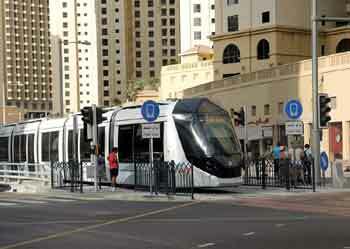 The 11.5km (7.1 mile) Doha tramway in Qatar which is planned to open in 2016 will use trams fitted with Sistras HES. Services will be completely wire-free, with recharging at the 25 stations. Because of the very hot climate the trams will feature an extra powerful air-conditioning system whilst special sun shades on the roof will protect the electrical equipment from radiant heat. The first trams for this service arrived in Doha in August 2015. (Doha will be the site of the 2022 football World Cup tournament). Siemens are also involved in the Chinese Guangzhou tramway project which uses trams that only use supercapacitors for energy storage. These are looked at in the Other Electric Solutions further down this page. 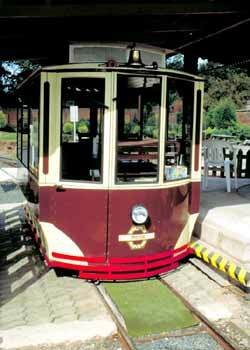 Wipost is a wireless power supply system that was created for the Translohr rubber tyred tram. The system is still being market by Alsthom who now own the Translohr brand and market it as New TL. 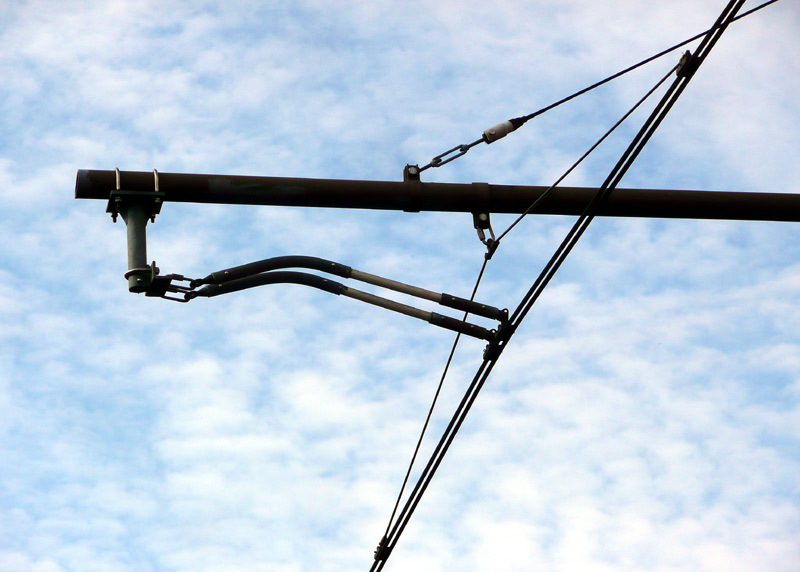 The Wipost system acts as a reverse catenary; what are called current injection points are located 3.3m high on street lighting (etc.,) support columns and these make contact with a power conductor strip on the roof of passing Translohr trams. 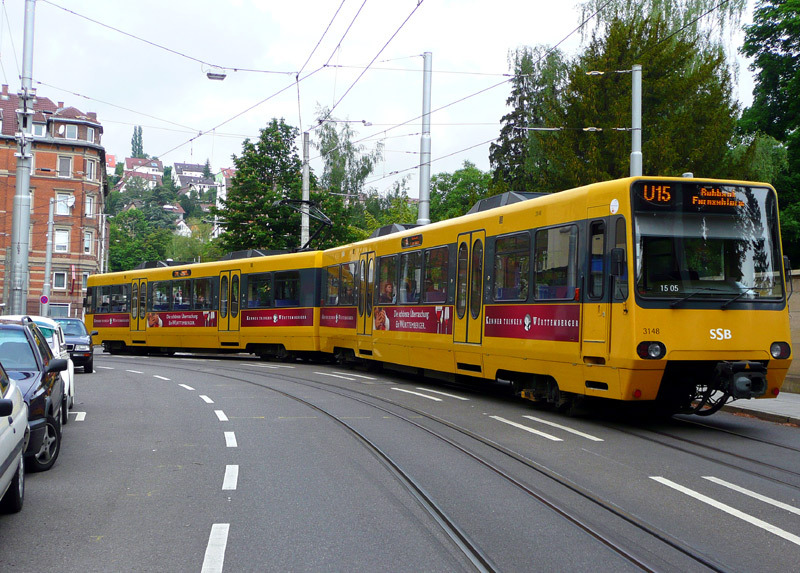 It is suggested that these only need locating at stations and where the trams accelerate (eg: traffic signals, steeper gradients) - at other times the energy stored in onboard ultracapacitors will be sufficient to power the tram. 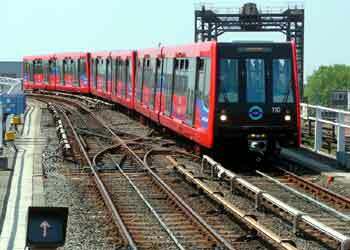 It is also said to be possible to combine Wipost and the normal pantograph power supply system along different sections of the same route. Schematic of a tram using Wipost passing the power supply injection points. 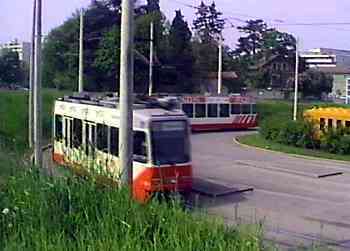 animated version of this image depicting a moving tram passing the power supply injection points. Catfree is a wireless power supply solution that was created by the Czech company Škoda. This builds upon a decade of experience with wire-free solutions for tram depots and electric trolleybuses which could also operate in battery mode. At present Catfree is designed to power a tram in wireless mode for about 3km (1.9 miles). The first commercial use of Catfree is in the Turkish city of Konya where fast-charge nano-lithium-titanium batteries power 12 Škoda trams when travelling through a 1.8km (1.1 miles) wire-free section of track in the city centre. The service these trams operate on is just 5.2km (3.2 miles) in length, and the use of fast charge batteries helps ensure that they are sufficiently recharged when travelling on the comparatively short wired sections of the route. These trams are in addition to a fleet of 60 Škoda trams being supplied to Konya for other services which will solely use overhead wires. Also in Turkey, the city of Izmir is planning to use wirefree trams; these are looked at in the Other Electric Solutions further down this page. Škoda has also entered into partnership with several Chinese companies to market wirefree trams. 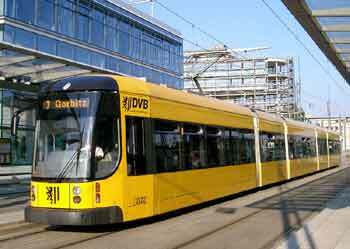 The partnership with CSR relates to trams which use supercapacitors. It is claimed that these trams can recover and reuse up to 80% of the their tractive energy, which it is suggested equates to an overall energy consumption that is 40% lower than traditional overhead wire technologies. In addition it is claimed that since overhead wires are not needed the tramway can be built more quickly and in ways which do not need to cater for current leakage via the tracks (because there won't be any current leakage!) 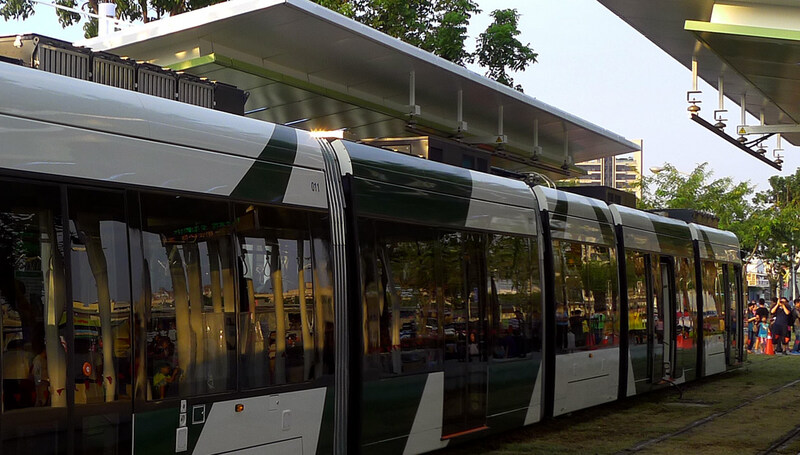 The supercapacitors will be recharged from energised connector bars attached to tram stop canopies. The partnership with Beijing Subway Rolling Stock Equipment Company relates to trams which use nano-lithium-titanium batteries, as in Konya. With over a 100 cities that have a population of 1 million people (or more), relatively little fixed infrastructure and an ever wealthier economy China is seen as nation which has plenty of scope for new tramways - both as primary transports in smaller conurbations where the cost and higher capacities of urban metros and / or other heavy rail solutions would not be appropriate and as secondary transports in the largest of conurbations. Launched by Alstom in summer 2015 SRS is advertised as being suitable for both trams and buses, regardless of manufacturer. The acronym SRS stands for Système de Recharge statique par le sol which in English can be described as a a static-based ground charging system. SRS is marketed as being a further development of the ground power APS technology which several tram systems use to collect electrical power from twin power conductors located midway between the tracks on the ground. In addition, whilst the implementation is different SRS also has some similarities with the opportunity charging systems which are becoming popular in some cities for powering electric buses without them having to carry enough onboard stored energy to last a full day. SRS works in conjunction with Althom's Citadis Ecopack energy storage system. On-vehicle capacitors are recharged at tram or bus stops during a 20 second stop dwell time. Power transmission is via pick-up shoes (one for trams, two for buses) which lower on to conductor rail(s) that - from how it looks in the animation video - are very slightly proud of the ground surface. Radio communications between vehicle and power supply system ensure that the power rail(s) is / are only energised when the vehicle is actually 'present and correct' and that the power transmission process is working optimally. In 2017 SRS will be installed on two new tramlines in the French city of Nice. https://www.youtube.com/watch?v=WRFRpBo-aiE (Alstom promotional film on YouTube showing both buses and trams). 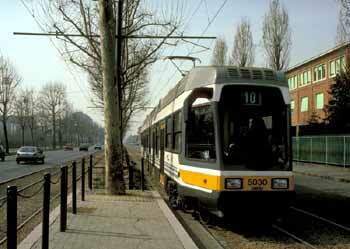 In 2005 flywheel energy storage was also trialed on a tram in Rotterdam, Holland. The fact that there are no reports of the further use of flywheels having been investigated suggests that these trials did not prove to be as promising as had been hoped. Whilst relatively rare the use of flywheels on electric public transports is not unknown. A small fleet of trolleybuses built in the early 1990's successfully used flywheels to achieve a 23% reduction in total energy use plus about 1km of off-wire use. However since then newer trolleybuses have used capacitors to recover braking energy. Several existing tramway systems are known to be planning or hosting trials involving retrofitting existing trams with capacitors of one sort or another. Primarily this is to discover by how much energy consumption (and hence operating costs) can be reduced through regenerative braking; in some cases the plan also includes simulating catenary-free running. Cities included in this comment are Paris, France (tramline T3), Geneva, Switzerland and Heidelburg, Germany. The 7.7km (4.8 miles) Guangzhou Haizhu Roundabout (Wanshengwei--Guangzhou Tower) tramway which opened in December 2014 has become the first tramway to be powered solely by energy stored onboard in supercapacitors that are recharged whilst calling at tram stops. Once fully charged the supercapacitors hold enough energy to travel about 4km, although they should not normally need to travel anything like this distance before the next station stop and recharging session. Regenerative braking is also used to recover energy when slowing down. 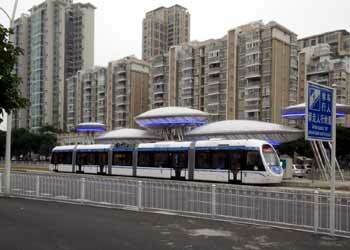 The trams were built by Chinese company CSR under a technical licensing and co-operation agreement with Siemens. Stage one of this tramway includes 10 tram stops. Guangzhou is in Guangdong province, China. 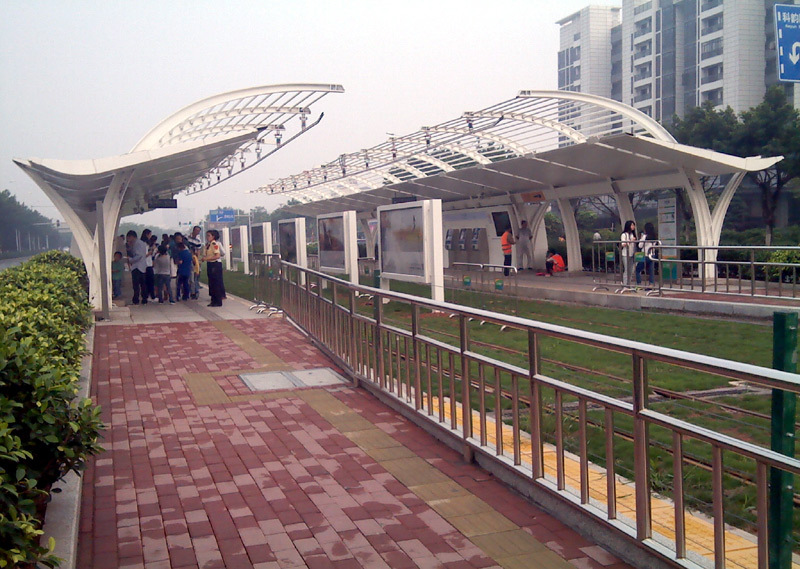 http://commons.wikimedia.org/wiki/File:5th_Tram_of_THZ1.jpg Wanshengwei Station showing the overhead power collection rail. In the hope of finding a viable alternative to overhead wires which can power a tram on full-day services there have been and continue to be trials of battery powered trams. According to the publication detailed below trials in Japan found that by using regenerative braking to recover energy that would otherwise be lost whilst braking there was a 22% increase in the distance a battery tram could travel, whilst using supercapacitors to store the recovered energy resulted in a further 10% increase in the vehicle's range. In addition, the temperature rise of the lithium-ion battery was reduced. This latter point is also significant, since whilst lithium-ion batteries offer the best combination of energy density / lowest weight, they are also extremely heat intolerant and require complex power management systems to prevent their igniting if they overheat or experience a fault. Fires involving this type of battery typically reach 2000° C and can melt concrete. Pub.Country: Japan / Language: Japanese. 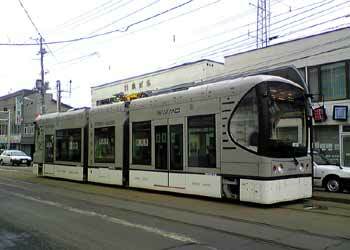 In circa 2006/7 the Japanese company Kawasaki Heavy Industries trialed the use of a 15 metre low floor battery-electric tram which was powered using a large GIGACELL® nickel-metal hydride rechargeable battery pack. 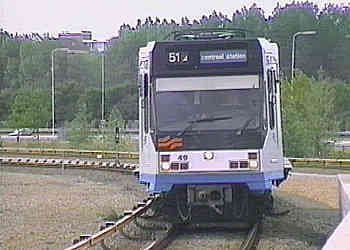 Trials included a 2 km test track at its Harima Works, which is where the fundamental features were confirmed, plus use on the 1067mm gauge tramway in the city of Sapporo. 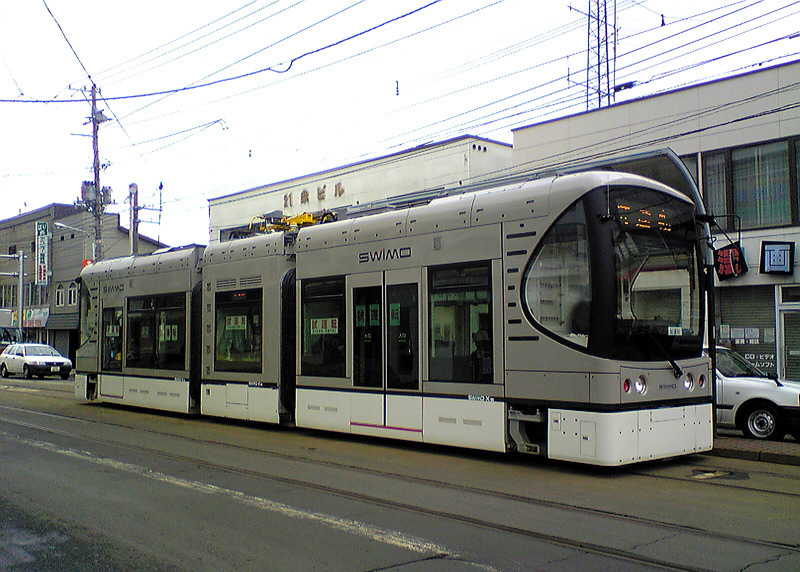 Kawasaki battery electric SWIMO tramcar on a March 2008 test run in Sapporo, Japan. The intended outcome of the trails included ensuring that after a short five minute charge the battery can store 20% of its total power, this being enough to operate for at least 10km, to discover how the tram functions in cold, snowy regions, and to confirm other features. The tram had a somewhat sedate design maximum speed of just 50km/h (30mph) which was still higher than its statutory maximum speed of just 40km/h (25mph). According to an article in Tramways & Urban Transit, April 2012, the Russians tested a battery-electric tram in the city of Yekaterinburg. However the quoted link did not lead to the information and a web search has not come up with anything either. 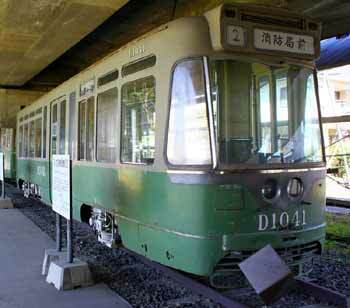 In April 2015 battery - electric traction was tested in the Japanese city of Kagoshima. 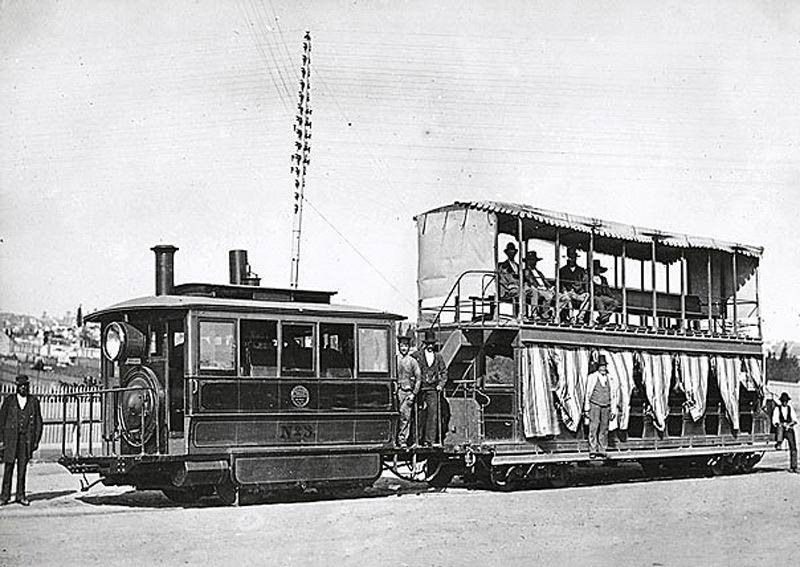 The tram was fitted with a 24.3kWh Toshiba SCiB lithium-ion secondary battery which is rated as being capable of operating in temperatures as low as -30° C and also designed to be highly resistant to overheating and catching fire, even in the event of a short circuit caused by external pressure. The battery is charged from the auxiliary power unit which converts the 600v dc power supply to lower voltages for on-board lighting and air conditioning. 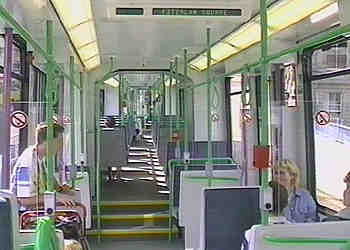 As a result the energy storage system can be located below passenger seats - rather than under the tram's floor. The Turkish city of Izmir is set to receive 38 trams which use lithium-ion polymer batteries with an expected wire-free range of 50km (30 miles). These will come from Hyundai Rotem of Korea and will be used on two tram lines which are expected to open in 2017. 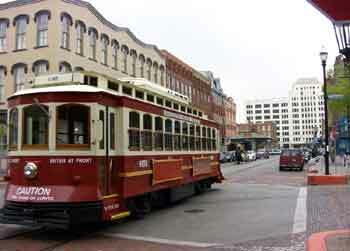 Battery powered trams are also used on several American short distance urban city centre / downtown distributor services. 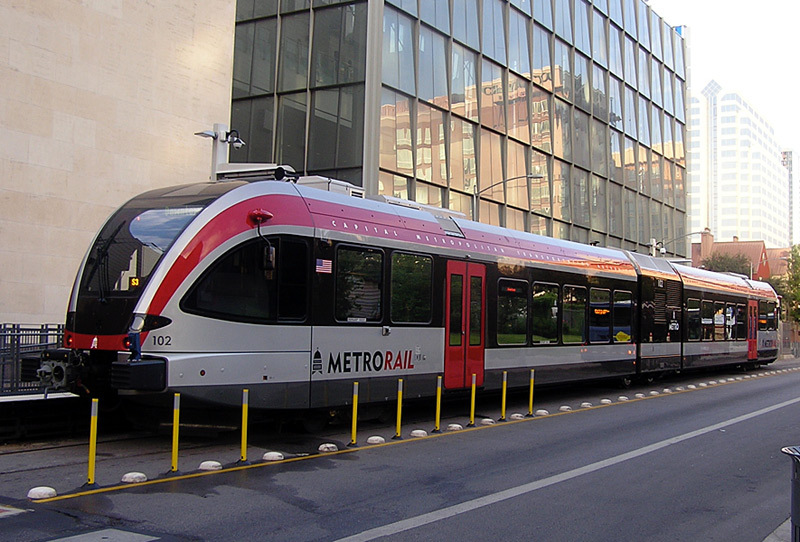 One of these is in the city of Dallas, Texas (USA) where the modern streetcar line augments the highly successful DART light rail system. A little under 2½ miles (4km) in length the Dallas Streetcar uses four Liberty streetcars built by Brookeville Equipment Corporation which were designed to be capable of off-wire travel using onboard energy stored in Lithium-ion batteries. Wire free mode is used when traversing the historic Houston Street Viaduct which dates from 1912. This structure is listed on the US Register of Historic Places and was not equipped with overhead wires. Dallas Streetcar Car No. 303 turning from Zang Boulevard onto Colorado Boulevard in the Oak Cliff neighborhood of Dallas, Texas, USA. 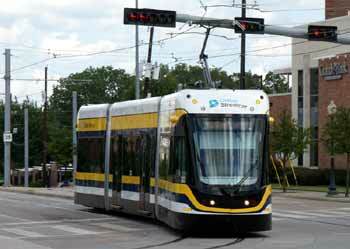 Note that the Dallas Streetcar should not be confused with the McKinney Avenue historic streetcar (also known as M-Line Trolley). 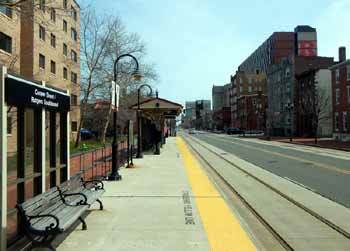 These are different systems, although there is a longer-term plan to extend the new service and its modern streetcars so that it and the M-Line Trolley become physically connected. Detroit's QLine Streetcar will also be using Liberty Streetcars in wire-free mode. 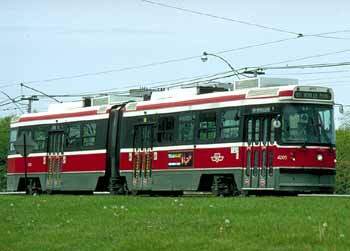 The last of its initial six streetcars are expected to arrive in January 2017. The last car of Detroit's first generation streetcar system was numbered 286, so it was decided to number the new cars 287 - 292, to continue from where the old number series had ended. London did the same with the trams used on Croydon Tramlink. Other US cities also have (or are building) local area distributor streetcar systems which do not include off-wire operations. 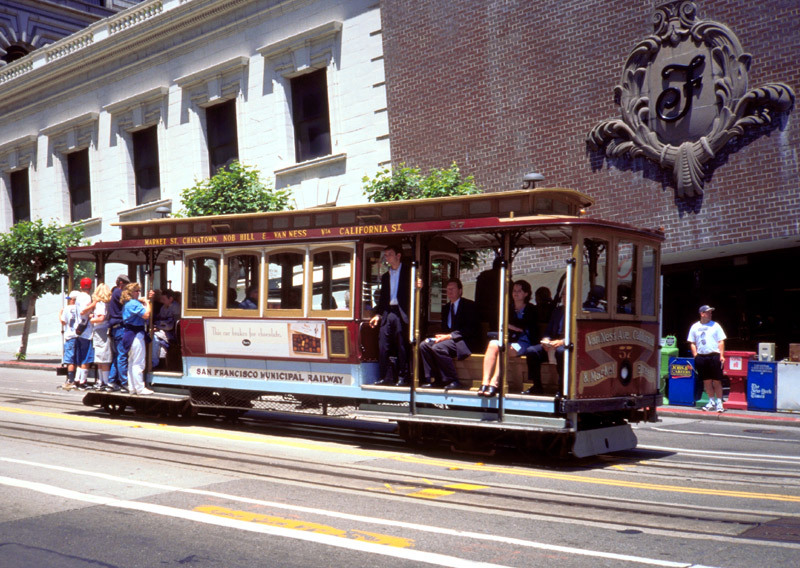 In California there are also several style battery-electric streetcar services which use opportunity charging via induction rather than overhead wires. These tend to be at locations which are privately-owned (ie: they do not use a public highway owned by a government body) but nevertheless within the areas they serve they act as mainstream transports. 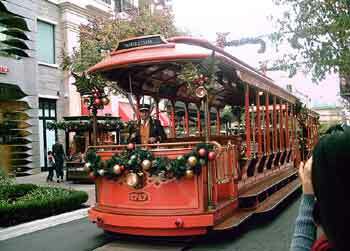 One of these is the Red Car Trolley at the Disneyland Resort in Anaheim. The induction power supply system comes from Brookville Equipment Corporation. What makes this streetcar installation stand out from all others is that in typical North American pastiche-ness it still uses trolleypoles that make contact with overhead wires; its just that the wires are dummy / not energised! This will be because whilst the service meets the real transport needs of people in the area it serves the location is a leisure-themed resort where overhead wires are seen as an essential aspect of a wider heritage theme. Photographs of the Disneyland Red Cars can be found on a page about transport nostalgia. 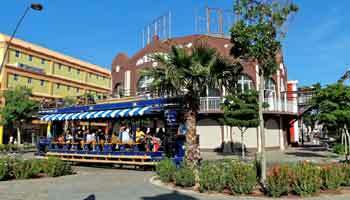 Los Angeles in California also has several outdoor shopping centres which have been themed around a small town where to help create the desired type of atmosphere they use battery powered streetcars that have replica / pastiche heritage styled new-build bodywork which has been fitted to re-used running gear (motors, wheelsets, trucks etc) that was recovered from scrapped first generation streetcars. Within the areas served these too perform as mainstream transports. These are The Grove at Farmers Market and Americana At Brand. The names of the companies which supplied the streetcars are included in the image description texts. 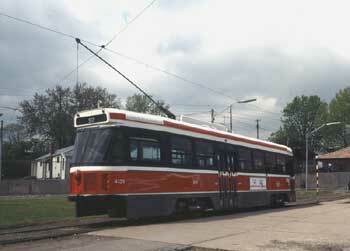 double-deck streetcar at The Grove. In addition to using regenerative braking to augment the overnight charging of the batteries, services at The Grove take advantage of what is called opportunity charging using Conductix-Wampfler IPT®	(Inductive Power Transfer) technology whilst at one of the two tram stops. This technology more widely known for its use with battery-electric buses - as detailed on Electric Buses page 2. Hydrail is the generic term denoting all forms of rail vehicles, large or small, which use on-board hydrogen as a source of energy to power the traction motors, or the auxiliaries, or both. Hydrail vehicles either convert the chemical energy of hydrogen to mechanical energy by burning it in an internal combustion engine, or by reacting hydrogen with oxygen in a fuel cell to create electrical energy which can either be stored in batteries / capacitors or used to directly power electric motors. 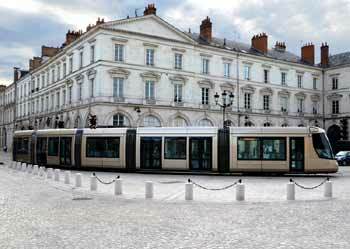 Hydrogen fuel cell powered electric trams exist as well, albeit as an experimental and niche technology. In Spain the metre-gauge regional services operator FEVE converted one of their former Belgian trams to fuel cell power to test the concept for use on non-electrified lines. The tram has two 12kW fuel cells which were chosen mainly because of their being near to mass commercial production rather than to obtain the best possible performance. It is also equipped with supercapacitor modules and lithium-ion batteries to store energy (for the auxilliaries) from the fuel cells and regenerative braking. 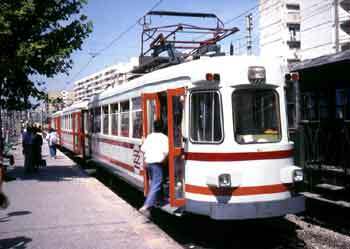 In 2012 the tram was trialed between Ribadesella and Llovio on the non-electrified Santander - Oviedo route. Former Belgian trams in Valencia, Spain. experimentally converted to fuel cell operation. Whilst it worked, it was very under-powered, with very slow acceleration and an extremely sedate maximum speed of just 30km/h (20mph). This is cited to be because of the low power of the fuel cells; by way of comparison the 2007 experimental fuel cell buses in London were equipped with two 125 kW fuel cells. Further information can be found at this link - or by conducting web searches. 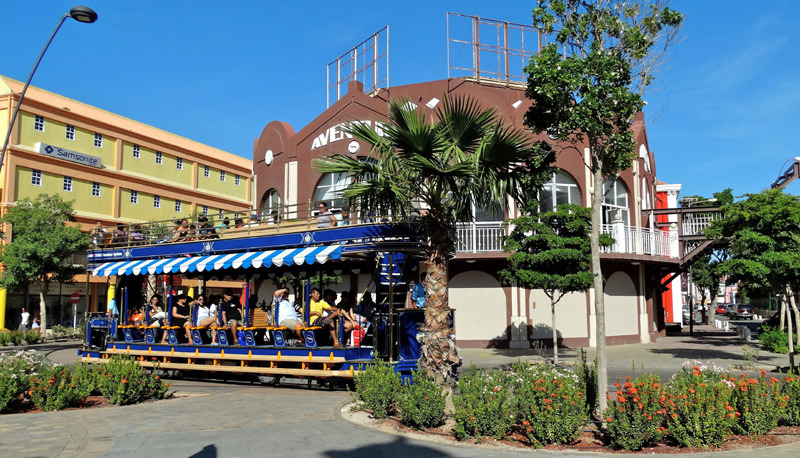 The first of hydrogen fuel cell hybrid electric streetcars were on leisure-themed systems in Oranjestad, Aruba and Dubai. For both locations the rolling stock comes from an American company called Transportation Innovations Group (TIG/m). The vehicles use lithium-iron phosphate batteries which are charged overnight and during the day receive augmentation charging from regenerative braking and an onboard fuel cell. During an eight hour shift the fuel cells use 2kg of hydrogen to produce 11kW of power. The hydrogen is sourced from electrolysis of water using grid sourced electricity. The hydrolyzer is located next to the fuel pump, ie: right where the streetcars have their onboard fuel storage tanks replenished. Research found that on-site production of hydrogen represented a better solution than buying it from specialist hydrogen producers who would have to send it to Aruba in pressurised cylinders. In addition to hydrogen the electrolysis process creates oxygen, which is vented at site, creating a rare example of what amounts to a waste gas that actually benefits its local environment! One reason for the choice of hydrogen as a primary fuel was its being seen as being cheaper than using overhead wiring and installing the tracks in a way which ensures that stray return currents do not become an issue. In addition, there would not be ongoing wiring maintenance costs. Presumably the maintenance costs of the equipment required by the hydrogen system was also included in the financial equation. When comparing power supply systems it is important to remember that these are short distance low-speed systems. The technology will not necessarily scale-up for larger systems with much larger rolling stock fleets and longer distance daily duties. Aruba is part of the former Dutch Antilles and near to Venezuela, South America. 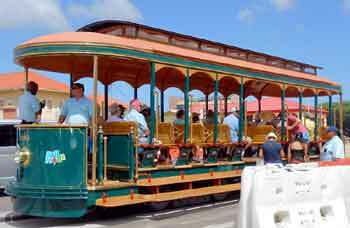 Located in Oranjestad, the streetcar line serves the cruise ship port on Main Street which is a shopping street that runs diagonally inland. The line is approximately 3/4 mile (1.2km) long and it is served by four streetcars, two single deckers and two open-top double deckers. The use of hydrogen as a fuel is only green if the hydrogen can be sourced renewably. There is no point sourcing the hydrogen using electricity derived from fossil fuels, as the net amount of energy produced would be less than that required to produce it - in other words it would be more energy efficient to connect the transports to the grid via overhead wires! However, that is not the case for Aruba. Being an island which is blessed by trade winds that blow all year round Aruba is able to source electricity in a clean, non-polluting and sustainable way. Therefore for Aruba the use of hydrogen is environmentally viable. Looking west along Main Street from the front of a streetcar. Formerly known as Caya Betico Croes, Main Street was renamed and pedestrianised as part of the streetcar project. 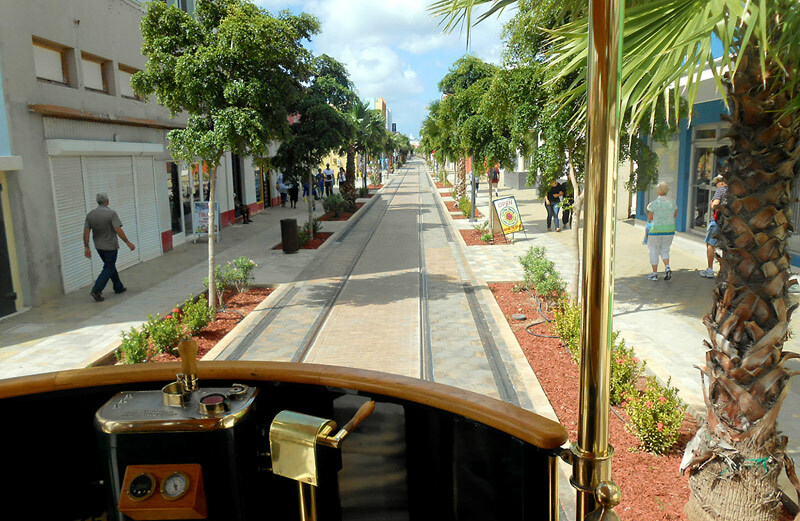 A single deck Oranjestad streetcar. http://commons.wikimedia.org/wiki/File:Oranjestad_streetcar_1265_in_2014.jpg A double deck Oranjestad streetcar. Image & license: Roel_van_Deursen / Wikipedia encyclopædia. The Dubai Trolley is a short central area distributor which when completed will be about 7km (4.3 miles) in length. 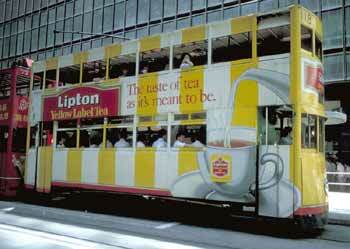 The fleet will eventually number 10 double-deck heritage-style open-top hydrogen fuel powered trams. 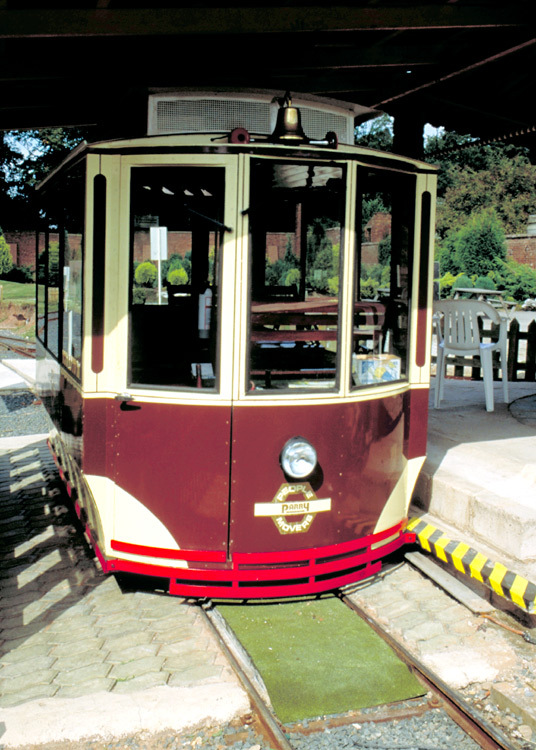 Although capable of speeds up to 50mph (80km/h), because of the leisure-themed ethos of this tramway the normal service speed will be just 10mph (16km/h). For the same reason the operating hours are based around afternoon - evening - late night shopping and eating out, rather than daytime users and commuters. Reflecting the local climate, the three stations to have opened so far feature air-conditioned waiting areas and the lower decks on the trams are also air-conditioned, although the plan is that in the cooler (or less-hot) winter months the windows will be removed allowing natural ventilation. In March 2015 a partnership between Czech company Škoda and CSR Qingdao Sifang of China saw the latter unveiling a prototype hydrogen fuel cell tram. This tram is claimed to be able to travel for 100 km at speeds up to 70 km/h before the fuel cells need a 3 minute refill. Whilst this prototype tram has three-sections it is of a modular design and the intent is to market it in a range of formats from two to five sections in length. In March 2016 Qingdao opened the first 8·8 km section of tramway (of a planned three route system) that is served by seven three-section ForCity 15T trams which for some of the time are powered by traditional overhead wires and the rest of the time are powered from hydrogen fuel cells. 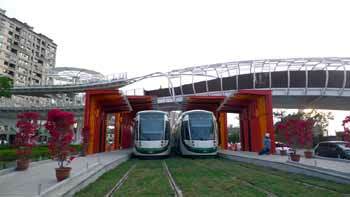 Qingdao Tram Line, Chengyang QT003. 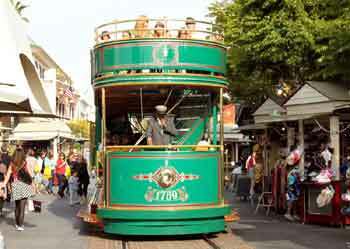 The cable system was originally introduced to replace horse-drawn trams in an era before electric traction became a realistic proposition. The idea is that very long cables are located in conduits which are between the running rails and just under street level. The cables move at a steady speed which is controlled from a (or several) power-house(s) situated near the tracks, with the cablecars obtaining propulsion by means of a special device which enters the conduit and grips the moving cable. The cable system was (and is) expensive to maintain. Sometimes the cables will break, halting all services on the affected section of track - although of course if the power fails then electrically powered services also suffer the same fate! 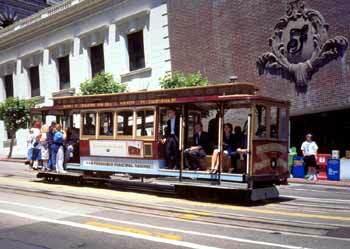 Nowadays the only surviving true cable car system is in San Francisco, USA, where there are three steeply graded routes which originally survived through sheer chance (ie: no-one ever got around to replacing them!) but are now kept as much for tourism and nostalgia as for any other reason. 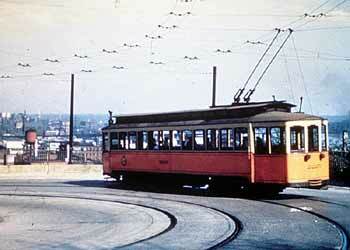 The last 'serious' urban cable cars were converted to overhead wire electric in Melbourne, Australia, in 1940. The one on the left operates on the California Street service, this vehicle is double-ended (can be driven from either end) and at termini uses simple 'stub-ends' to reverse direction; the other type of vehicle operates on the Powel - Mason / Hyde routes, and must use a turntable to turn round. A section of street trackage showing slotted third (centre) rail through which a device attached to a cablecar grips onto the moving cable. 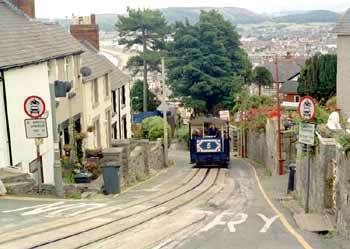 The lower section of the Great Orme Tramway includes some street running; for safety motor vehicle access to this road is restricted to authorised vehicles only - this is to avoid the hazard of a tramcar travelling in one direction meeting an oncoming vehicle travelling in the opposite direction on a road so narrow that there is no space to pass. Clicking the Great Orme Tramway image (or here) will lead to a dedicated page showing larger and more images in a new window . Great Britain used to have several cable powered tramways, London was the first with a line serving the hilly Highgate area in 1884. Most of them were eventually converted to electricity. 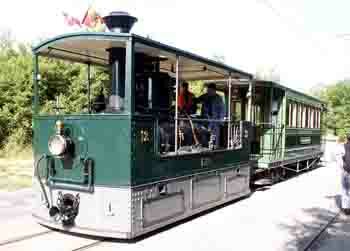 Nowadays only the Great Orme Tramway in Llandudno, North Wales is still in operation. However whilst this line is cable powered and for part of its route is a true street tramway, it is actually a funicular railway where ascending and descending trams counter-balance each other. Cable powered transports (of various types) are looked at in greater detail on the Cable transports page. 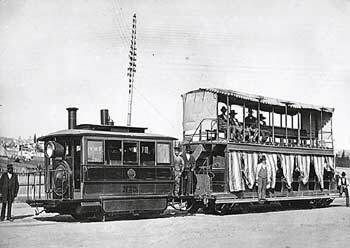 Some locations used steam powered trams, either through small steam locomotives fitted with side panels that hide the coupling roads so as not to frighten the horses, or through autonomous trams fitted with a steam engine. A fully functioning steam tram locomotive and passenger trailer still exist in the Swiss city of Bern and in the summer are used on a special historic nostalgia service. More information can be found here: (Some readers may wish to use online language translation utilities) . the steam motor and a trailer car. Dated circa 1879.
http://commons.wikimedia.org/wiki/File:Steam_Tram_(2688542952).jpg Historic steam tram in Berne, Switzerland. On occaisions this is still used, albeit only for nostalgic purposes. Image & license: Neobu / Wikipedia encyclopædia. Public Domain. Despite the attempts to reduce their impact the steam locomotives did sometimes frighten the horses which in that era were widely used to haul street-based transports, and many people also disliked their noise, smoke and steam. Before electricity became a viable proposition another motive power system which found favour in some places was the use of compressed air traction. The onboard compressed air supply tended to be recharged at termini. This was first used in 1879 the French city of Nantes and although it was adopted in several towns and cities by 1917 they had all either closed or converted to electricity. http://en.wikipedia.org/wiki/Mekarski_system It is possible that other language Wikipedia pages will have more information. 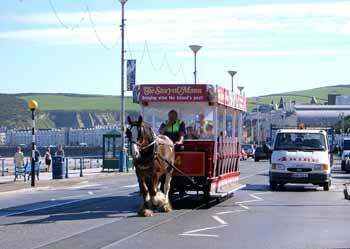 The first trams were horse drawn, and this method of propulsion is still in use in Douglas, Isle of Man, albeit nowadays in the summer months only on a leisure-orientated tourist service. Clicking this image will lead to a dedicated page showing more (and larger) Isle of Man transport images in a popup window; alternatively clicking here will open the page in a new full-size window . 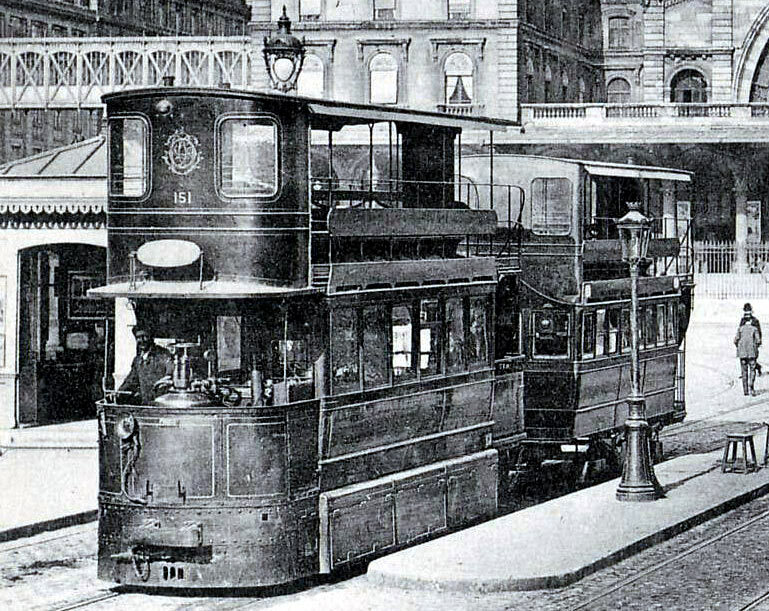 A Parisian compressed air powered tram which used the Mékarski system, circa 1900, outside Paris Gare de l'Est railway station. Scanned from ancient postcard / historic image, no longer in copyright. The Belgian 'Vicinal' was a large network of inter-urban lines that cris-crossed the nation. Little of the system was ever electrified and instead it used special street-compatible steam engines which in time were replaced by diesel trams. This survicing fragment operates on tourist orientated services in Han-Sur-Lesse, Belgium. In 2014 one of the A.R. 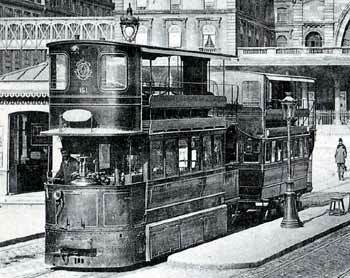 145 diesel trams was rebuilt as a battery-electric tram . At the village centre route terminus it takes advantage of the interval between journeys to 'opportunity charge' its batteries. 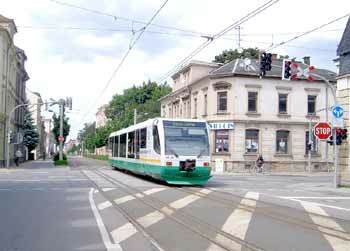 In 2015 a second tram was converted to electric traction and eventually the remaining two will be converted similarly. The use of diesel powered trams (and even trains) within the street environment is fairly rare, but not unknown. The name tramtrain (or tram-train) is often used to describe what is usually a tram-type vehicle that also ventures on to mainline railway metals. 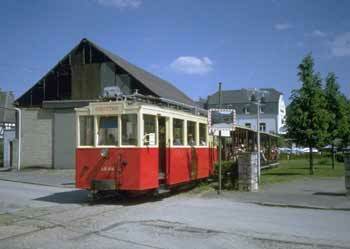 This is something different to street railways, where mainline trams travel on the public highway. A Nordhausen (Germany) "Duo" tramtrain on the linking track between the urban tramway (where they are electrically powered via overhead wires) and the rural heavy rail HSB (Harzer Schmalspurbahn / Harz Narrow-Gauge Railway) - where they are powered via an onboard diesel engine. A lighterweight diesel train travelling in street tramway mode through urban streets in Zwickau, Germany. Two services in the USA which use street-compatible lightweight diesel light rail vehicles are the Camden - Trenton New Jersey "River Line" which follows the River Delaware along the New Jersey / Pennsylvania border and the Capital MetroRail in Austin, Texas. Both of these involve sharing tracks with freight trains and street trackage in the 'downtown' (which in proper English means the city centre). River Line train passing a level crossing near Hiway 73.
http://commons.wikimedia.org/wiki/File:20070421_RivertonNJ_D80_NearHiway73.jpg The Cooper Street / Rutgers University station, which is in the section of track that travels along city streets; unfortunately not filmed when a train was passing by. Between 1958 and 1964 Sapporo in Japan incrementally built several small batches of diesel trams to serve non-electrified tramway extensions to an existing electric tram network. As passenger traffic increased it became financially viable to convert to electric traction and in the period 1967 - 1971 the diesel trams were withdrawn from service and either rebuilt as electric trams or scrapped - save for one of the 1964 batch which ended up being preserved in a museum. Image & license: Michlaovic / Wikipedia encyclopædia. Public Domain. http://commons.wikimedia.org/wiki/File:Austin_Metrorail.jpg Sapporo City Transport D1040 Diesel tramcar, now preserved in a museum. Also in the USA several city-centre distributor and preserved museum streetcar lines source their energy from fossil fuels instead of grid-connected electricity. The Savannah River Street Streetcar uses two former Melbourne, Australia trams which date from the 1930's and have been converted to use B20 biodiesel as the prime source of energy. This vintage trolley type of service is primarily aimed at weekend visitors to an historic rejuvenated boutique shopping district, it has six stations and re-uses abandoned railway tracks located in a cobblestone river front roadway called River Street to the east and west of City Hall. 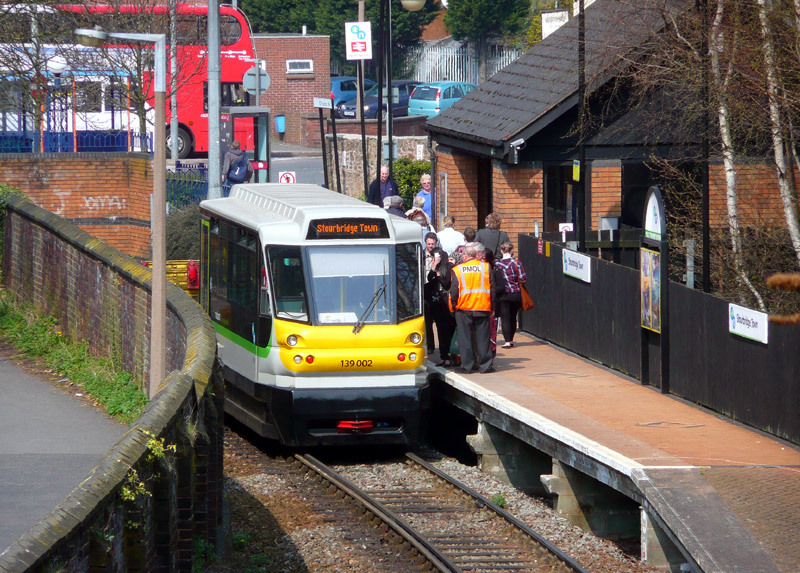 Future proposals include extending the route and adding to the fleet, if these come to pass the line is expected to be converted to overhead wire electric. The locally produced B20 biodiesel comprises 20% recycled cooking oil from local restaurants, animals fats and vegetable oils and 80% oil diesel. The power generated from the generator attached to the liquid fuel internal combustion engine directly powers the tram's electric motors. The trams also use ultracapacitors for onboard energy storage. The Galveston (Texas) Island Trolley chose to use diesel-electric vintage styled streetcars (which were built in 1988) so as to minimise hurricane weather related problems from damaging the overhead wires. Unfortunately it was so badly affected by Hurricane Ike in September 2008 that services had to be suspended. However the various governmental bodies have promised that at some stage funds will be available to make the required repairs so that services can be restored. As yet (2015) that promise still awaits fulfillment. Technically these cannot be trolleycars. 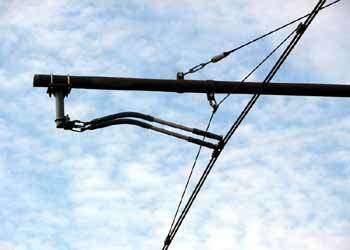 since they do not use trolleypoles to collect power from overhead wires. Therefore they should only be called streetcars. However only the purists will understand - or care about this! Trolley and old buildings along the Strand in Galveston. 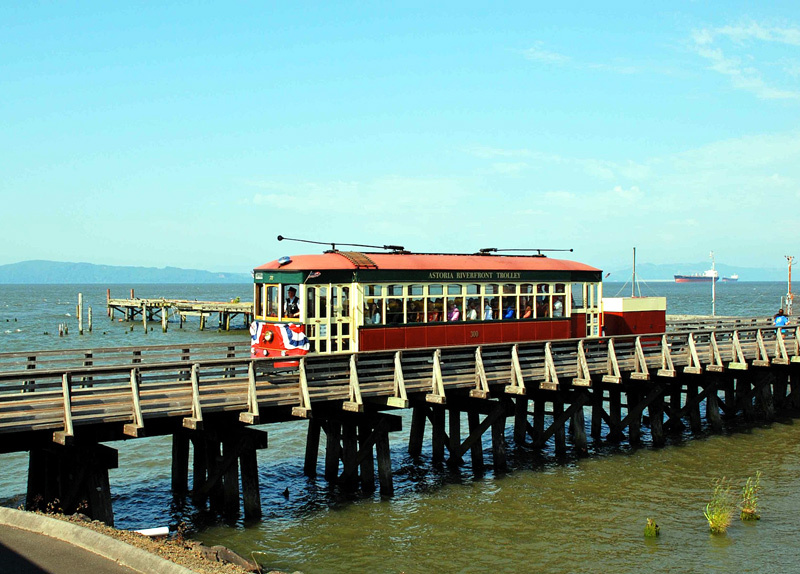 http://commons.wikimedia.org/wiki/File:Galveston_strand.jpg Astoria Riverfront Trolley car 300 with a trailer carrying a fossil fuel power source travels westbound on a trestle over a minor inlet of the Columbia River. Whilst some fossil fuel powered streetcars locate the fossil fuel power plant within the vehicle, others place the fossil fuel power plant on a trailer. 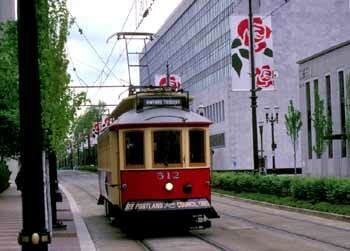 The Astoria Riverfront Trolley is an example of the latter. 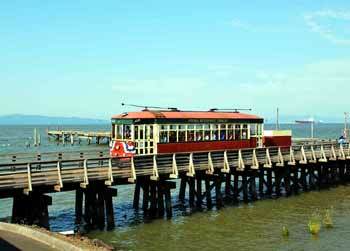 This heritage streetcar line in Astoria, Oregon, has been in operation since 1999. Car 300 is an ex-San Antonio (Texas) streetcar built in 1913 by the American Car Company, by that time a subsidiary of the J. G. Brill Company. Although the Astoria line is not equipped with overhead trolley wires, car 300's two trolley poles (one for each direction of travel) have been re-installed on its roof, to improve the historical accuracy of the car's appearance. An important aspect of modern vehicle designs is accessibility, to avoid duplication this is looked at on the Easy Access page. Direct links to other Passenger Train Variations pages.